The 2017 Annual CRLRA AGM "Michael Stone 9-Hole Golf Challenge" has beeen run and won but the details of the scoring system are as confusing as Einstein's Theory of Relativity. 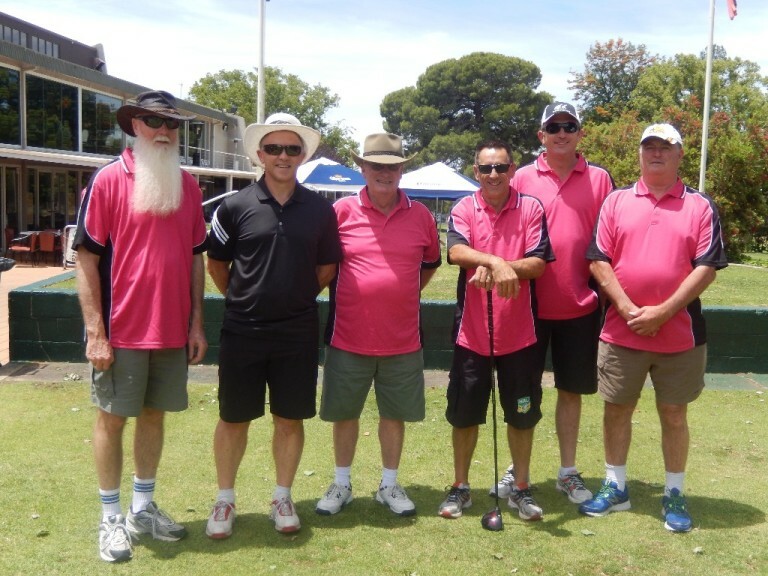 In any case, Stoney's quantum maths came up with winners for best score, worst score, shortest drive and nearest the green (as no one actually landed on the green). Check out the event photos in our Photo Gallery. A great day of hacking around the course was had by all and everyone is already in training for next year's event. 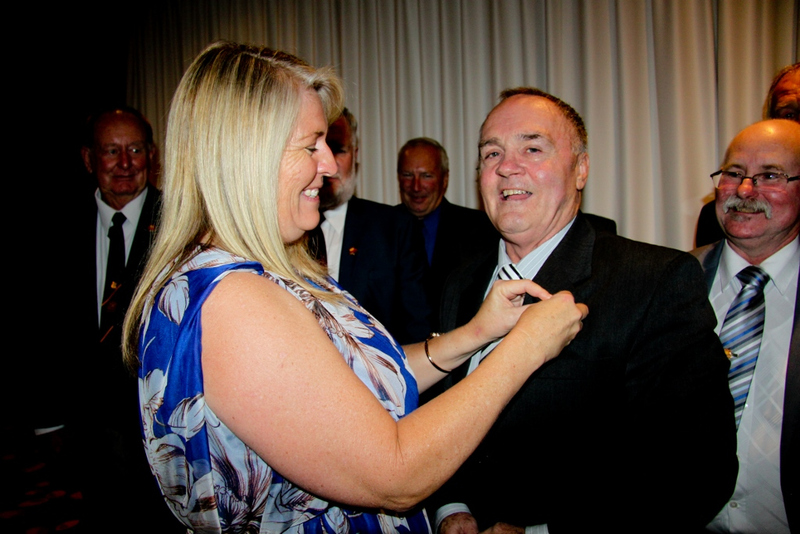 A special congratulations to CRLRA Honorary Treasurer, Kevin Rayment of the Group 3 Referees Association, for being bestowed with Life Membership of our Association at last weekend’s AGM at The Entrance. He becomes the thirty-third CRLRA Life Member. 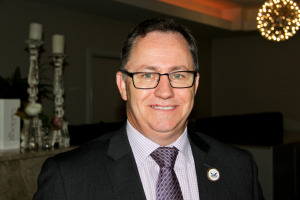 Kevin has been an integral part of our Association since 1984 as the delegate from Group 3 and in later years has served as our Vice President, Secretary and now Treasurer. The whole of the CRLRA joins us in congratulating Kevin and sincerely thank him for his significant contribution. 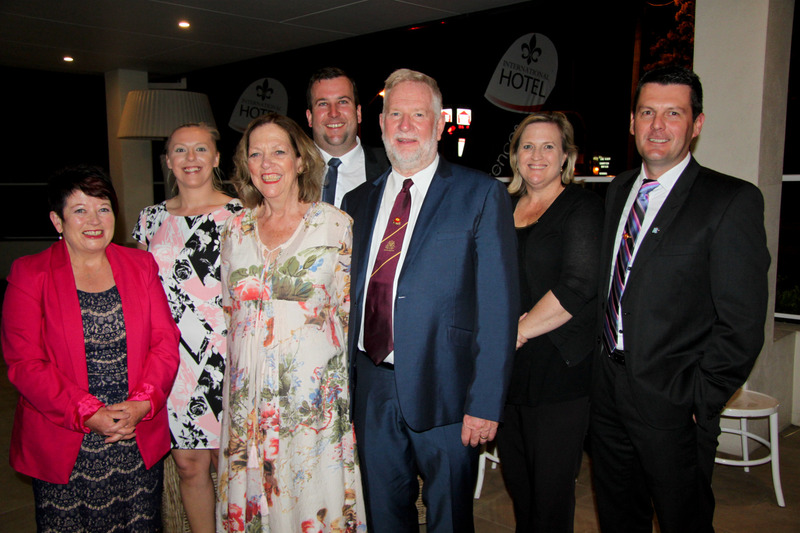 Check out the photos of the 2017 AGM Dinner at The Diggers, The Entrance by clicking on our Photo Gallery and selecting the album. 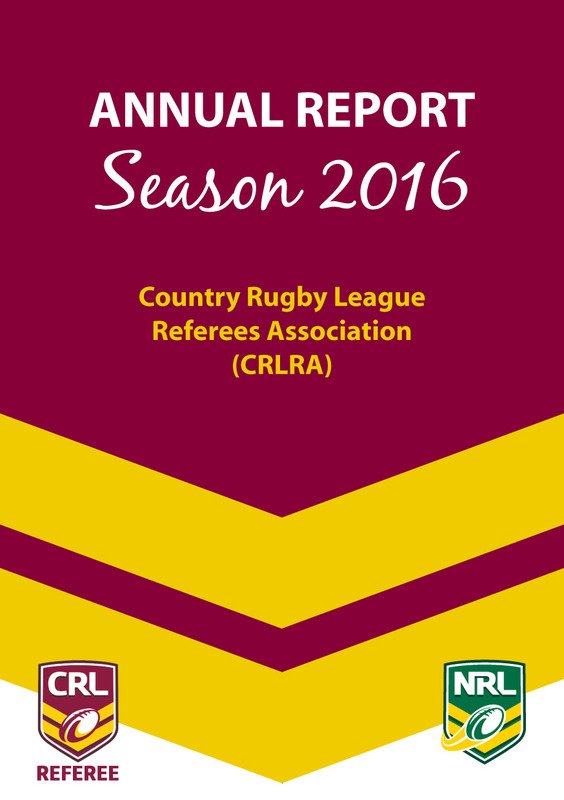 The CRLRA Executive has issued its Annual Report for 2017 at the AGM hosted by the Central Coast Referees Association at The Entrance on the weekend of 3rd to 5th November. Click here to download a copy. My first formal duty after taking over as Honarary Secretary is to distribute the attached CRLRA Seminar form to all members of the CRLRA. PLEASE NOTE THAT ALL REFEREES PARTICIPATING IN THE DEVELOPMENT SQUAD AND CMO PROGRAMME ON FRIDAY WILL BE REQUIRED TO STAY ON SITE THURSDAY NIGHT. There is no charge for those attending the CMO and Development Squad sessions for the Thursday night accommodation and Friday breakfast & lunch. Of course, the much prized Tony Young Shield Laws Quiz. Along with many other great sessions designed to make us all better referees and match offical coaches. The cost this year is again held low due to the CRLRA support of all those attending. The seminar program, two nights shared accommodation and meals will cost $80* and Seminar Polo Shirt is $20*. Forms need to be returned through Association Secretaries (not direct to CRLRA) by the 23rd January 2017 or you may miss out. Numbers are strictly limited so do not delay in returning your form. *Those who do not attend all sessions and lectures will be fined a minimum fee of $165 for the cost of attendance and $30 for the polo shirt. This will be billed to your association. I look forward to seeing as many there as we can fit in. 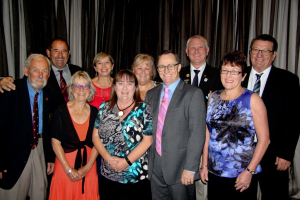 The 2016 CRLRA AGM held at Wagga Wagga saw the election and induction of two very deserved members to Life Membership of our Association. Kevin Forde and Wayne Wilson become our thirty-first and thirty-second life members respectively and it is only the fifth time in our history that we have elected two new Life Members in the same year. Both of these valuable members of the CRLRA have devoted significant time, effort and energy to the advancement of our Association and their elevation to our highest honour has been widely acclaimed. Congratulations to both Kevin and Wayne from everyone in the CRLRA. Congratulations to the Group 9 Referees Association for hosting a great AGM function in their home city of Wagga Wagga. Particular thanks to the prime organisers in Tony and Vivienne Fletcher along with their band of helpers. All who attended were very appreciative of the programme that they provided on the weekend. 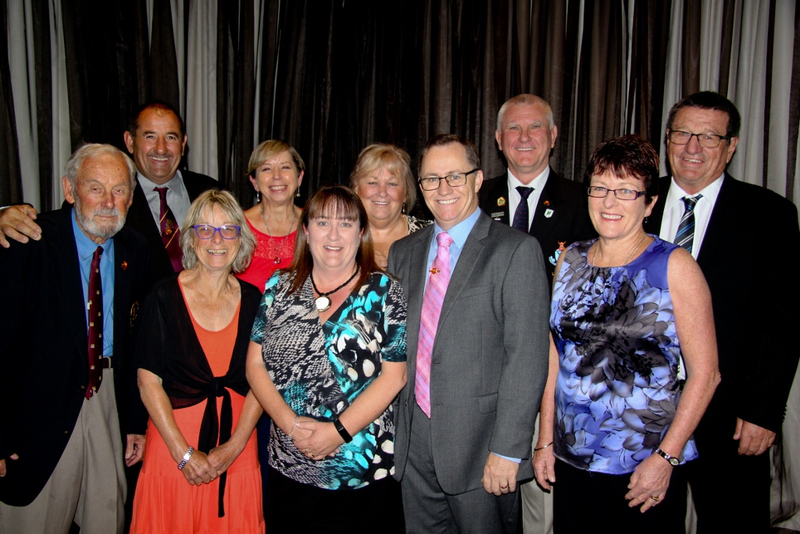 END OF AN INCREDIBLE "CAREER"
The 2016 CRLRA AGM saw the closing of the curtain on an incredible "career" for our longest serving Executive team member. 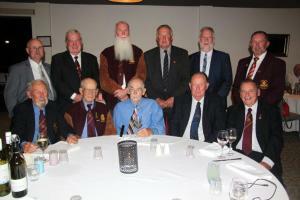 Frank Kitcher has served the CRLRA as its Honorary Treasurer for an astounding forty years. 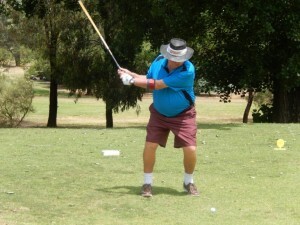 Prior to this year's AGM Frank made the decision to not seek re-election for a 41st term. 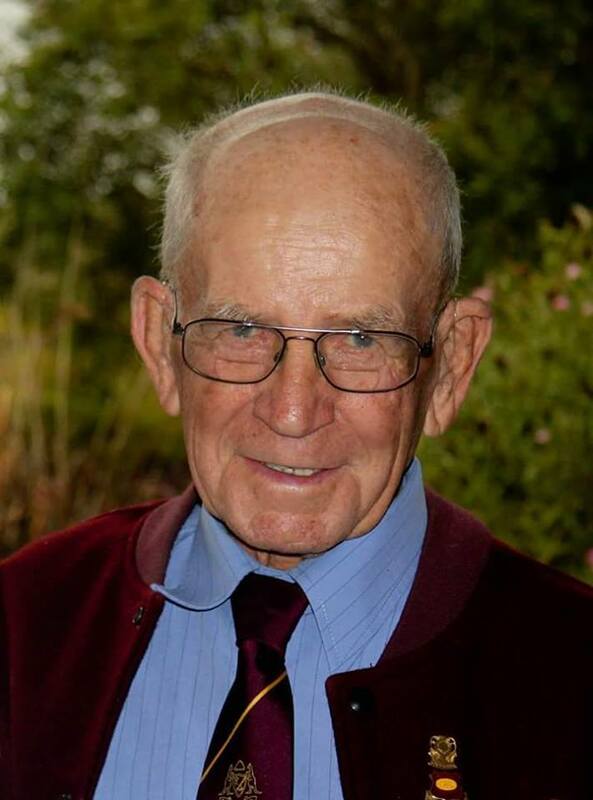 The Association is indebted to him for his many years of service which has also been acknowledged by the Board of the CRL who voted to bestow on him their newest award which is the CRL Service Medal. CRL Chairman John Anderson, CEO Terry Quinn and Operation Manager Bert Lowrie all attended the CRLRA AGM and jointly announced this significant award to Frank. Congratulations Frank on your incredible journey with the CRLRA and the sincere thanks from all members for your contribution. 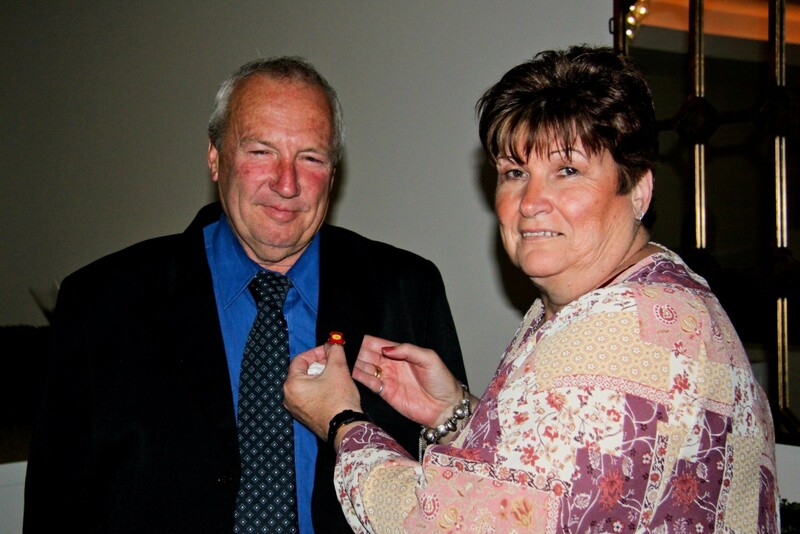 Our sincerest thanks also goes to Frank's wife, Jan, who has also been an integral member of our CRLRA Family for those forty years and will continue to be for years to come. 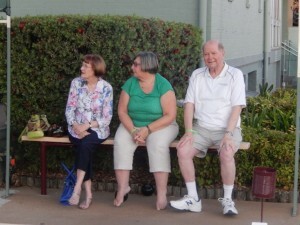 Jan advised everyone in attendance that "Frank was your Treasurer, but he is my Treasure". 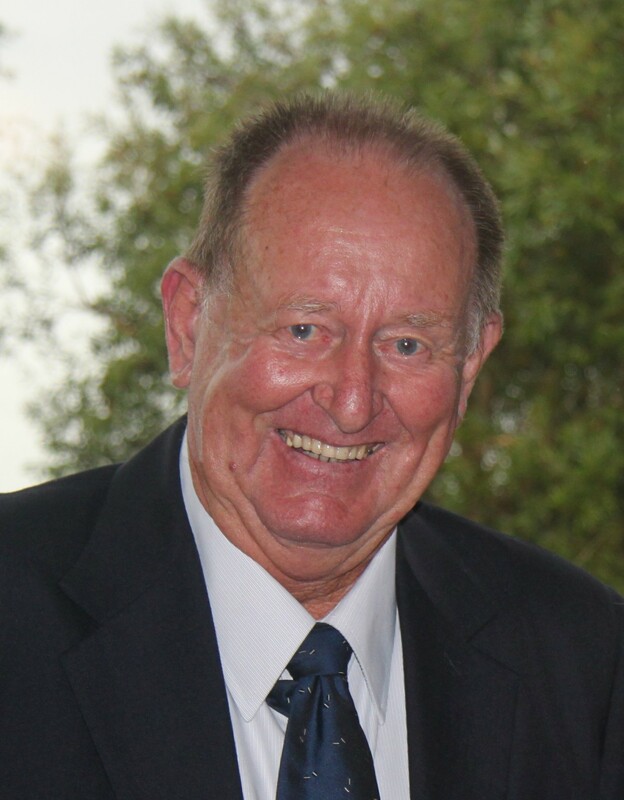 The CRLRA welcomes a new member to our Executive team in Geoff Whiddon who hails form the Newcastle Coalfields Referees Association and takes on the role of our Honorary Secretary. Geoff takes the reins with a wealth of experience behind him in that he has held various positions with his home Association over a number of years. 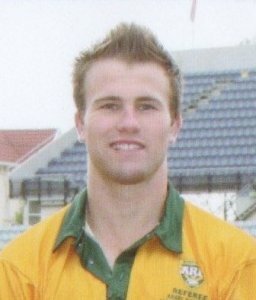 He is also a previous winner of the NSWRLRA's "Denis Braybrook Award" for his services to Junior Referee Development. Geoff replaces our Secretary of the past four years,Kevin Rayment, who has been elected to fill the very large shoes of long serving outgoing Treasurer, Frank Kitcher. 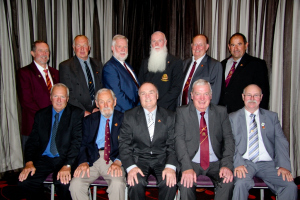 The other Executive incumbents remain unchanged with President, Will Druery, Deputy Chairman, Kevin Forde,and Honorary Lawyer, John Meehan being returned unopposed while Vice- Presidents Mark Edwards and Steve Brown were returned after ballots. It was great to see that several of the Executive positions were contested by multiple candidates which stands the Association in good stead by having people prepared to put up their hands to take on Association roles. 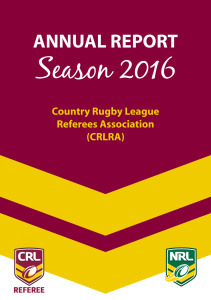 The CRLRA Executive has issued its Annual Report for 2016 ahead of the AGM to be hosted by the Group 9 Referees Association this coming weekend in Wagga Wagga. Click here to download a copy. The CRLRA has called for nominations for Executive positions to be filled at the upcoming Annual General meeting to be held in Wagga Wagga on Saturday 12th November. For those who believe they can add value to the Association could they please complete the attached form and forward it to the Secretary who must receive it no later than Saturday 5th November. As we approach the conclusion of another season there are undoubtedly some among us who are asking the question as to whether we will go around again for another year in season 2017. For some it will relate to active on-field officiating and for others it will be deciding whether or not we again put up our hand to contribute and assist with the running of our Associations and providing official support to our fellow referees. Some of us will ponder over this decision after having provided active and non active service over a decade or two but I doubt whether there would be many out there who have decided that time is up after four decades. 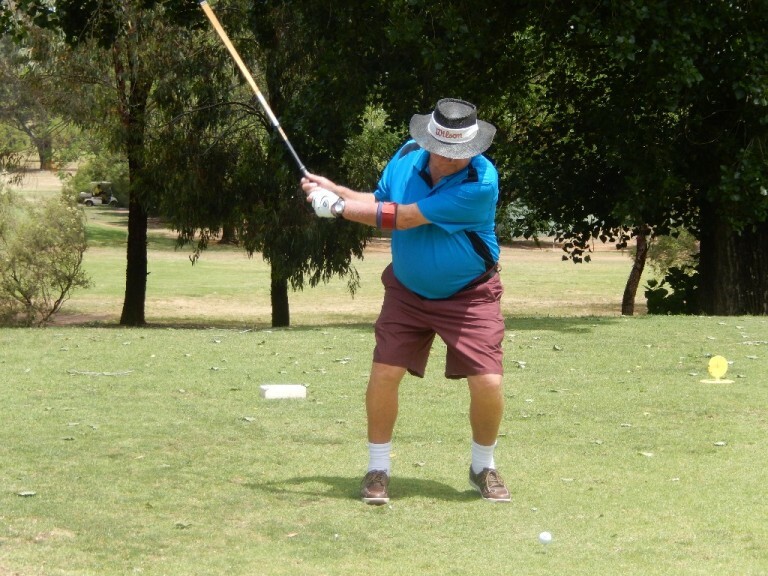 The CRLRA will be much the poorer in 2017 and beyond after it's long-serving Honorary Treasurer of FORTY years, Frank Kitcher, made the decision recently to not seek re-election to the position at the upcoming AGM in Wagga Wagga in November. 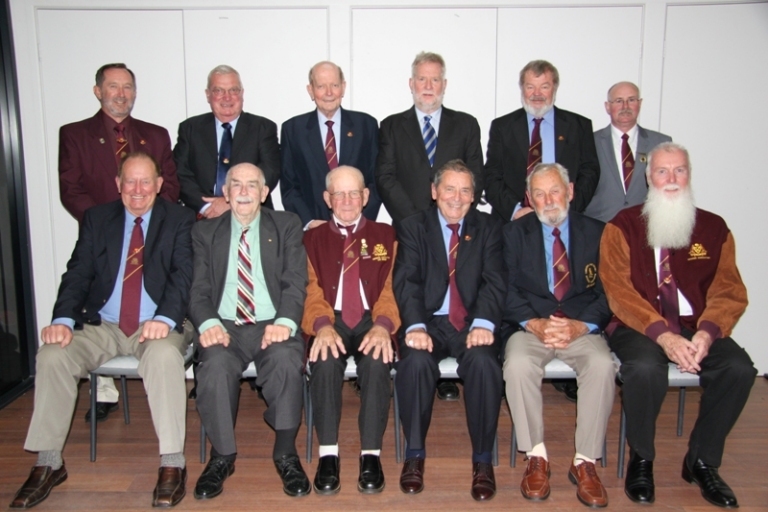 Frank is the last of the esteemed triumvirate of the late Nick Best OAM who served as Honorary President for thirty-one years (1981-2011), Kevin Riolo OAM who served as Honorary Secretary for thirty-six years (1977-2012) and himself with forty years as Honorary Treasurer (1977-2016). That makes him the Association's longest ever serving official and it's extremely doubtful whether anyone will ever surpass this record. 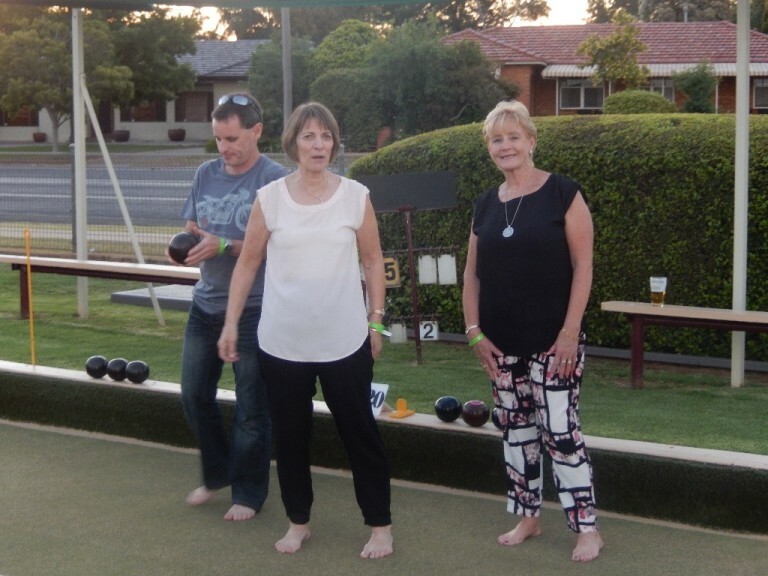 It's not uncommon for someone who achieves Life Membership of an organisation for recognition of meritorious service to run out of steam not long after that and fade out of the limelight. Not so with Frank who continued in his role for a further thirty years after being awarded Life Membership of the CRLRA in 1986. Although we will miss Frank's in depth reports on the dollars and cents, debits and credits, we will definitely not miss his companionship and his support. He will continue to play a part in our great Association as do all of our surviving Life Members and past Executive members and we wouldn't have it any other way. Congratulations to all members appointed. Congratulations to all of these members and good luck on the day. Congratulations to all of these members and good luck on the day. We know you will do the CRLRA and your Associations proud. It is with much sadness that the Executive of the CRLRA advises the passing today of another of it’s much loved and respected Life Members in Thomas Arthur (Nick) Best OAM. Nick served as the President of our organization for thirty-one years from 1981 to 2011 inclusive. A Life Member of the South Coast/Group 7 Rugby League Referees' Association and former President of that Association for twelve years, Nick’s contribution to Rugby League and Refereeing has been acknowledgedextensively and includes Life Membership of the CRLRA, the CRL and the ARLRA as well as the ultimate honour to be bestowed on any sports volunteer, the Order of Australia Medal. This comes as no surprise because during his time as President of the CRLRA he was also a member of the CRL General Committee and the CRL Appointments Board. He was a foundation member of the NRAS which he served on since 1992 and was a member of the planning committee set up to establish the ARLRA and also sat on that Board since its inception through to 2011 including many years as its Deputy Chairman. Nick will be sadly missed by the whole of the refereeing fraternity. He has influenced so many people during his lifetime and they include some of the game’s leading officials of today by virtue of the times that he coordinated and coached the match officials for the ASSRL National Championships. We all send our sincerest condolences to Nick’s dear wife, Marion and his family who were Nick’s first love ahead of his refereeing, fishing and golf. He was seventy-nine years of age. Vale Nick. 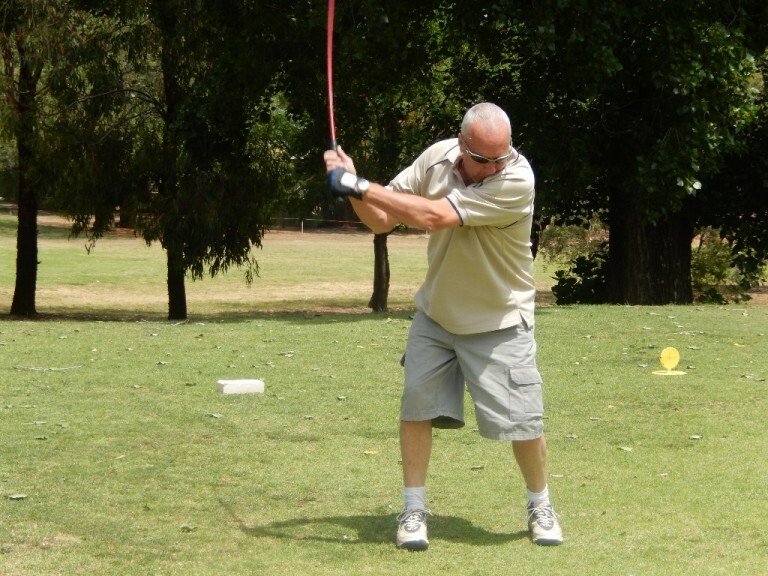 Only two months after his passing, our great friend Tony Young has once again been honoured by his community of Young for his tireless dedication and commitment to sport. See the story of his inclusion in the Young Sports Walk of Fame as reported by the Young Witness newspaper. RECORD numbers gathered on Saturday night to celebrate Young’s finest sportspeople of 2015 at the 23rd Young Sports Advisory Committee presentation dinner. In support of the CRLRA and it's Affiliated Associations, the CRL has created a new position to focus on referee recruitment and retention. 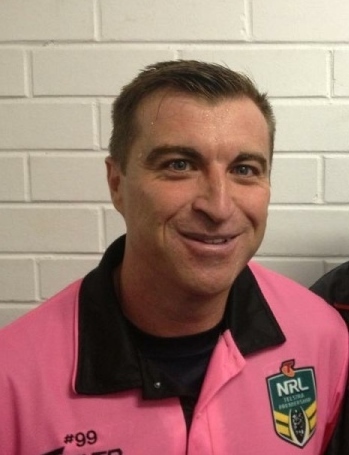 Well known and respected Central Coast representative referee, Rob Bowen, has been appointed to this new role of "CRL Referees Recruitment and Participation Officer". 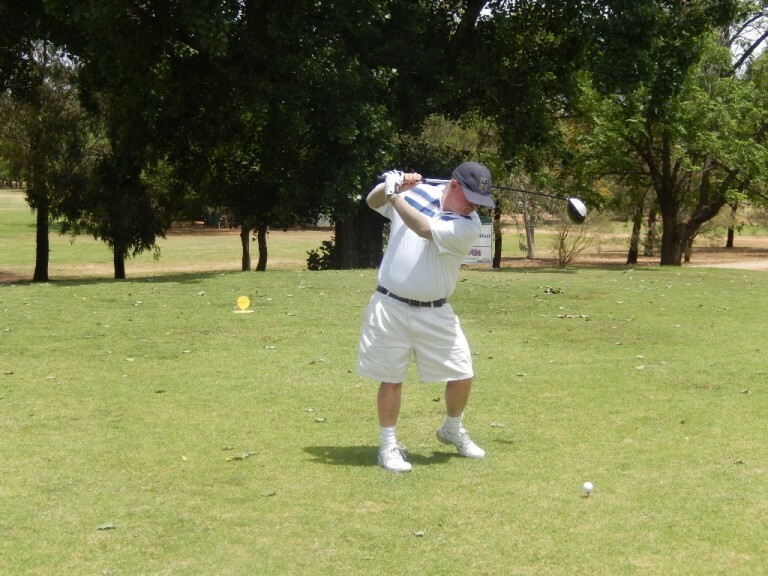 Rob has already hit the ground running and has been contacting our Affiliate Associations with resources and offers to assist with their membership activities. The Executive of the CRLRA applauds this appointment and look forward to closely working with Rob. The newly appointed CRL Referees Recruitment and Participation Officer, Rob Bowen, has sent out the link below for use by Associations in their Recruitment activities. See below for an important message from Brad Levy, NRL Education, Training and Research Manager, to all referees of the Modified games. "A player may be temporarily replaced if injured – but for a maximum of three (3) minutes at any one time. If the three minute period is exceeded the replacement is permanent. Any replacement player, coming on in the first half, shall play out the match (to comply with Law 7). Note: Temporary replacement of three (3) minutes is to count as part of the injured player’s playing time…refer to Law 7." The Law states that, if a player exceeds the 3 minute injury period, this is deemed as a “permanent” replacement. For the purpose of this Law, this shall apply to the period in which he/she was injured & replaced. There should not be any issue with the player returning to the field at a later time. Keeping in mind that each player should be playing a minimum of one unbroken period, it is reasonable for both the replaced and replacement players - if fit to return in the case of the injured player - to return and play for at least a period of time which equates to a full period of play (i.e. 10 minutes). Please note that, if the replaced player is wearing a DH/FR vest and has subsequently swapped the vest to another player, he/she may not wear the vest again during the match. Whilst this is not necessarily policed by match officials, this is for the information of Referees, CMO’s and Associations. Best wishes for the imminent start of competitions across the Country. There is a tremendous amount of refereeing wisdom among the trio of keynote speakers who presented at this year's 2016 CRLRA Annual Seminar. Fitting with the theme of "Respecting the Past … Mapping the Future - Dream.. Believe.. Achieve", we had three past greats of refereeing reprersenting different eras of the game in Michael Stone, Greg McCallum and Steve Clark. The first two are no strangers to our Annual Seminar with bothe of them involved in preparing the agenda, organising special guest speakers and themselves presenting for many years in the past. This definitely demonstrates their interest, dedication and commitment to grass-roots refereeing. It was good to see Greg come along this year and his presentation was definitely oif interest to our younger members who aspire to the levels that he has been able to achieve. Thanks you to all three of our key-note presenters. 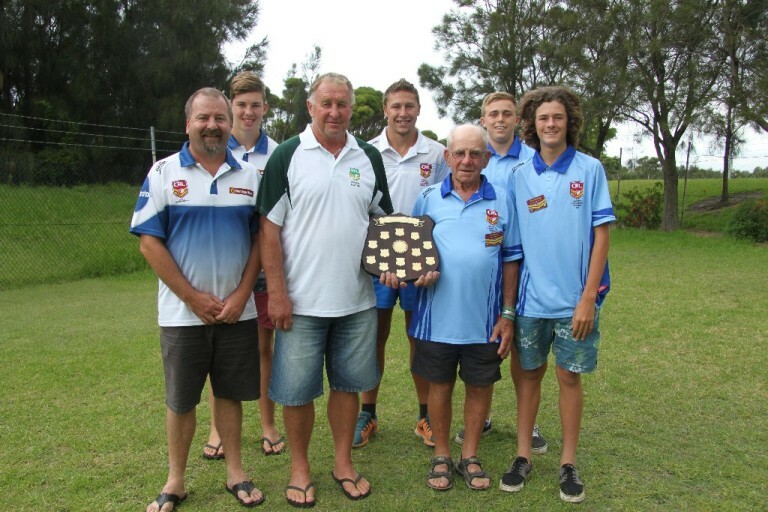 Congratulations to the Newcastle Coalfields Association for taking out the 2016 Laws Quiz and therefore the "Tony Young Shield". Once again it was hotly contested with Group 9 breathing right down the winners' neck with only 0.78 of a mark between them. Group 6 rounded out the top three. With our good friend Tony Young leaving us only a few weeks ago he definitely was there in spirit smiling and standing next to his son, Scott who presented the shield on behalf of his dad. 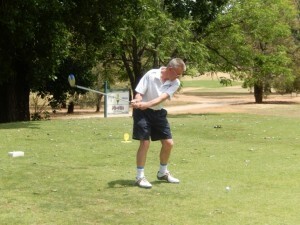 The highest individual score of 47 was shared by Phil Dawes (Gp6), Toby Popple (Gp9) and Troy Nuwhan (Woodbridge Cup). 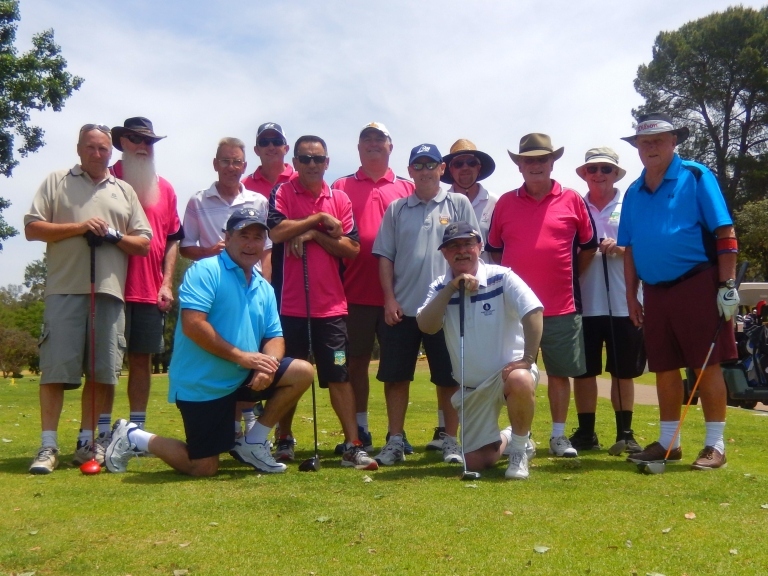 There were five people who obtained a perfect score in the Mod component and those were Tim Bailey (Woodbridge Cup), Andrew Astill (Illawarra), Andrew D'Arnay (Gp16), Toby Popple (Gp 9) and Mat Navin (Gp6). Congratulations to all of the winners and also to the organisers of this year's quiz. Tony would be proud of the results that you have achieved. The weekend of 12-14 February 2016 saw another great CRLRA Annual Seminar conducted at The Surf Leisure Resort Wollongong with a comprehensive agenda and entertaining and knowledgeable presenters. With a theme of "Respecting the Past, Mapping the Future, Dream, Believe, Achieve" the weekend was al about learning from past greats and being able to put into place individual future goals and plans to achieve them. 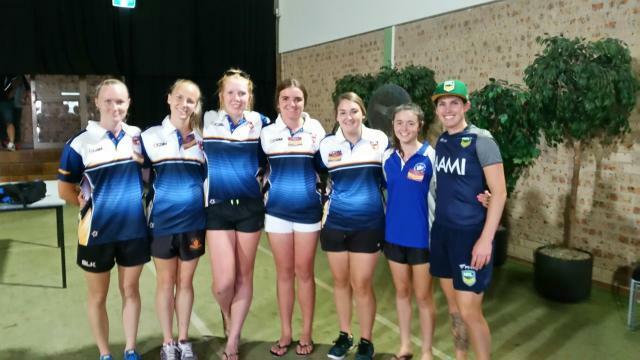 It was fantastic to see the number of younger members in attendance and particularly the number of female officials who undoubtedly would have been inspired by the presence of NRL official Casey Badger who passed on her words of wisdom to the ladies. Congratulations to the organisers being the Executive and the RDO's for their tireless efforts in outting together such a great weekend. In particular, many thanks to our hard-working Secretary, Kevin Rayment, who did all of the logistics organisation and co-ordination which is no mean feat in itself. The smooth running of the weekend is testimonay to his hard work. 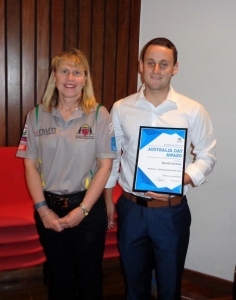 Australia Day 2016 was a memorable day for Group 6 Treasurer, David Gorman, when he was included in a very prestigious group of people in the Camden district where he was nominated as Sportsperson-of-the-Year. The competiton was of a very high standard and David was successful in the hunt for the top honour but he was justifiably proud of the certificate that he was presented with recognising his nomination for the award. Congratulations David from all in the CRLRA. (Photo shows Camden Sportsperson-of-the-Year, David Gorman with Group 6 member Kim-maree Teale who attended with him on the day). 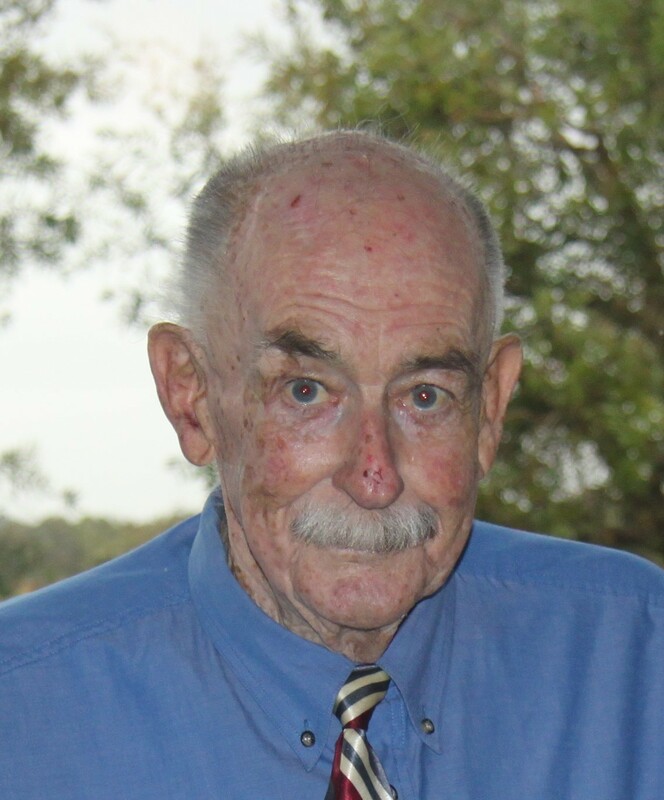 It is with much sadness that the CRLRA marks the passing of one of its much loved Life Members in Tony Young who was also a Patron of our Association. Tony’s rugby league resume is amazing and exceeds seventy years from the time he started his playing career in country NSW. His life memberships include NSW Group 9 Referees, NSW Group 9 Rugby League, NSW CRLRA, Riverina Referees, Riverina Schoolboys' Football Carnival, Boorowa Junior Rugby League Club, NSW Group 9 Junior Rugby League, Young & District Junior Rugby League, NSW Woodbridge Cup Rugby League, Young Junior Rugby League Club, NSW Group 12 Referees, NSW Woodbridge Cup Referees and the Australian Rugby League Referees’ Association. He has been a regular participant of the Annual CRLRA Seminar for most of his refereeing years and was the prime mover behind establishing the Annual Laws Quiz Challenge where affiliated Associations compete for the “Tony Young Shield”, a trophy that he himself donated. 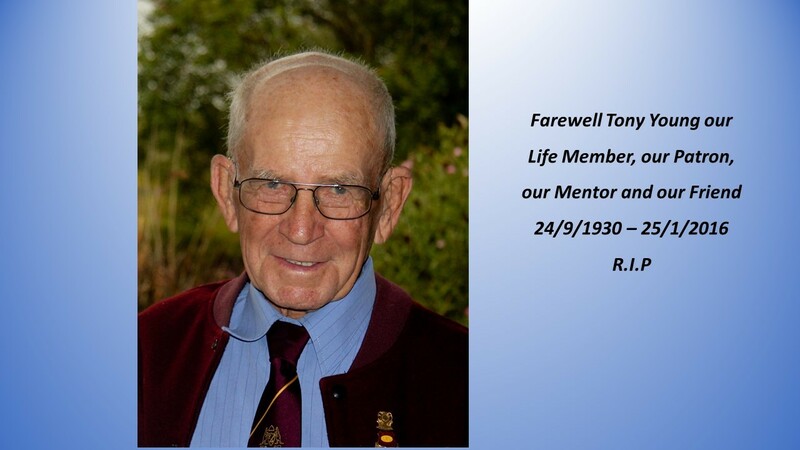 Our Association will be poorer from the loss of our beloved friend and we pass on our sincerest condolences to Tony’s lovely wife Mitzie and his devoted family. The CRLRA Annual Seminar will be held at Breakers Resort Fairy Meadow on Friday 12th February, Saturday 13th February and Sunday 14th February 2016. An extensive programme has been developed with Development Squad Referees and CMOs invited to take part on the Friday. Forms are at the bottom of this item. Development Squad Referees and CMOs are requested to attend the Seminar from Thursday night 11th February. 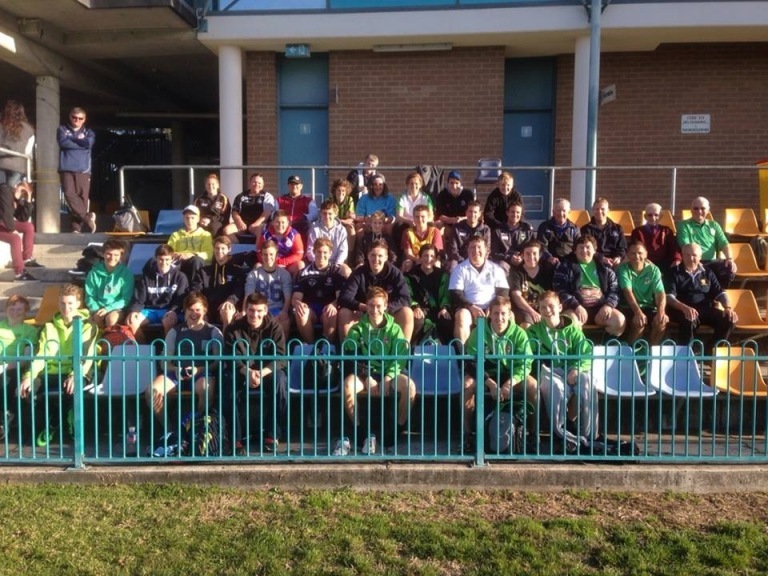 Funding has been provided by the CRL and NRL for this component of our extended programme this year. Our thanks to Steve Clark for his assistance with this. 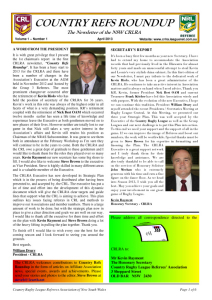 Also to the RDOs, Richard Johnston, Michael Stone and Dennis Spagarino for their input into the weekend programme. The CRLRA Executive looks forward to seeing you soon. 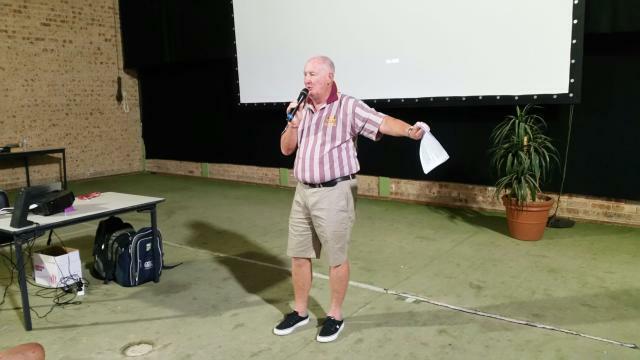 Another great AGM event for the CRLRA at Diamond Beach organised this year by the Association Executive but moreso by our Honorary Secretary Kevin Rayment and his lovely wife, Cheryl, who both worked tirelessly to make the weekend a resounding success. In spite of the inclement weather there were still plenty of camaraderie and laughs interspersed with the more serious side of organising the running of the Association. Congratulations to all present for your involvement and participation. The photo shows those of our Life Members who were in attendance. Go to our Photo Gallery to see more photos of this great event. Another successful CRLRA Mick Stone "Memorial" Challenge at Royal Tuncurry saw the assembly of the usual Burglars dressed in their finest regalia of snow white, punishing pink and stinging bees accompanied by an assortment of normally dressed golfers. 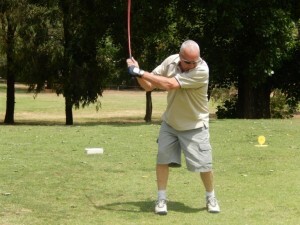 A great day of relatively ordinary golf but extraordinary fun. Go to our Photo Gallery to see more photos of this great day. Saturday 17th October saw the Group 6 Referees Association conduct their Annual Presentation Night at Wests Leagues Club and what a successful night it was. The awards presented were well received by all in attendance and it was great to see so many of the younger brigade enjoying the culmination of another successful year for the Association. The photo shows the gathering of all of the night's award winners. Congratulations to all. 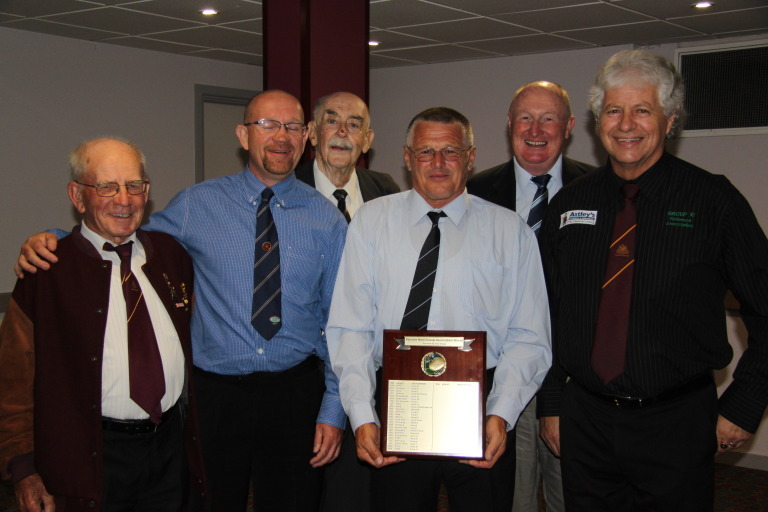 The Illawarra Referees Association conducted its Annual Dinner and Presentation on 10th October and history was made with the awarding of the Association's equivalent of Club Person of the Year, the "Ned David Award". For the first time ever a female was the recipient of the trophy in Amie Gibson. But wait, there's more. There were also dual winners for the first time ever and Amie's fellow recipient was none other than her fiance, Michael Chin with whom she will walk down the aisle in January 2016. 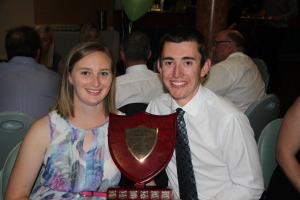 Both Michael and Amie were presented with the trophy in recognition of their dedication and hard work in overseeing the development of the junior referees in the Illawarra Association. Both of them have taken on the role of coordinating the junior appointments and the allocation of coaching "buddies" to all of the young ones. The announcement was a popular one with every one in attendance on the night. If you think that you could add value to the workings of the CRLRA then you have only a few days to put up your hand for a position on the CRLRA Executive Committee. Written nominations must be in the hands of the Honorary Secretary no later than Saturday 7th November. The official nomination form is attached. 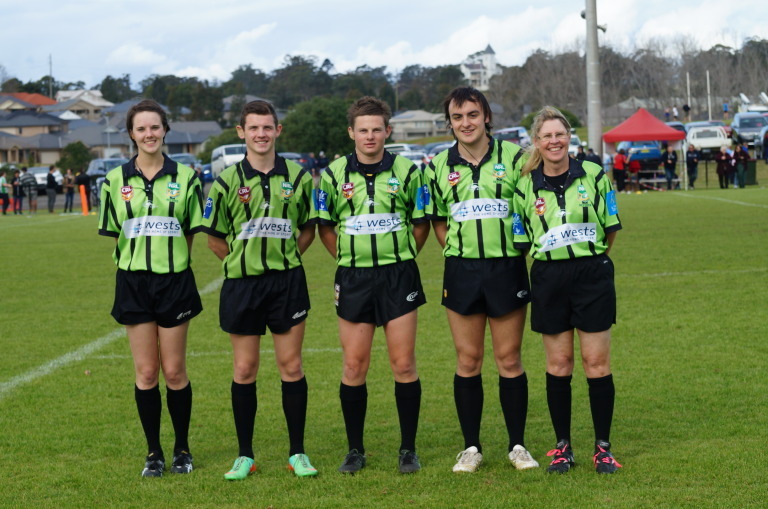 Congratulations to all Referees who officiated in Country Representative Games in 2015. 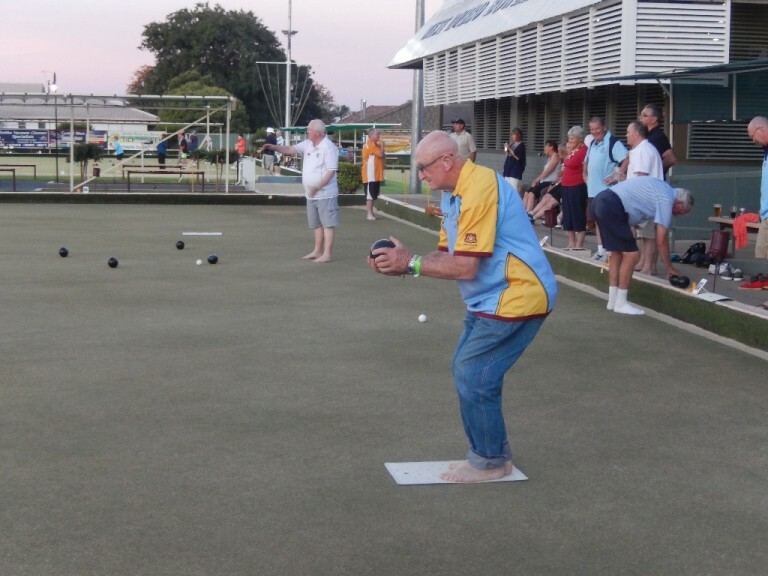 A complete list is below… Good luck to those controlling the Finals in Mudgee this weekend. The updated "February 2015 Rugby League Laws of Mini Footy and Mod League" is now available and can be obtained through your local Association. If you wish to download a copy to your Computer, I-Pad or Mobile Phone then you can Click here to obtain it. The first stage of the NRL Participation Pathways Review Project has resulted in some important changes to the Laws of both Mini and Mod for 2015. The new Mini-Mod Laws Book is in the process of being printed with a whole new look but in the meantime below are the changes to be adopted in 2015. Firstly you will find a poster showing a summary of the new laws by Clicking here. And lastly you will find a document with some FAQ's that might be useful by Clicking here. "And the Wheels on the Bus Go Round, Round, Round..."
"And the Wheels on the Bus Go Round, Round, Round..." was probably heard all the way from the Queensland border to Wollongong and back for last weekend's 2015 CRLRA Seminar. The Northern Rivers RA members travelled the 900km in a hired bus with captain Jeff Wheeler at the helm and first mate Steve Toms as navigator. They were definitely in good hands as all arrived safely. The Northern guys weren't the only ones who "bused" it. The Group X1 Referees with Troy Warner at the helm steered themselves by bus as well but they only had to travel half the distance of their northern cousins. Well done to both Associations. The final speaker at the 2015 CRLRA was Shayne Hayne who retired from active officiating after his appearance on the 2014 NRL Grand Final and has since been appointed as the NRL's Coach of the Emerging Squad. Shayne detailed his journey from a young 16 year old referee in Group 21 to his retirement as the Number 1 NRL referee thirty-one years later. He described his NRL career as like a rollercoaster with its highs and lows and your enjoyment and achievements will depend on how you bounce back from the lows. He advised everyone that no matter what grade you are appointed to control you must referee at the level that you wish to be at. Do not change your own standard even if the standard of game us not where you want to be. 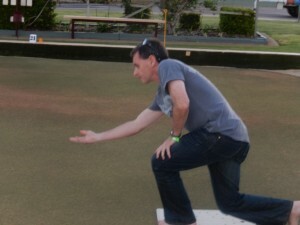 In his whole career Shayne has never forgotten where he came from and has been actively involved in his home Association. Firstly Group 21 and more recently Central Coast. During his career he has also acted as an NRAS Provider putting countless new young referees through the accreditation process. 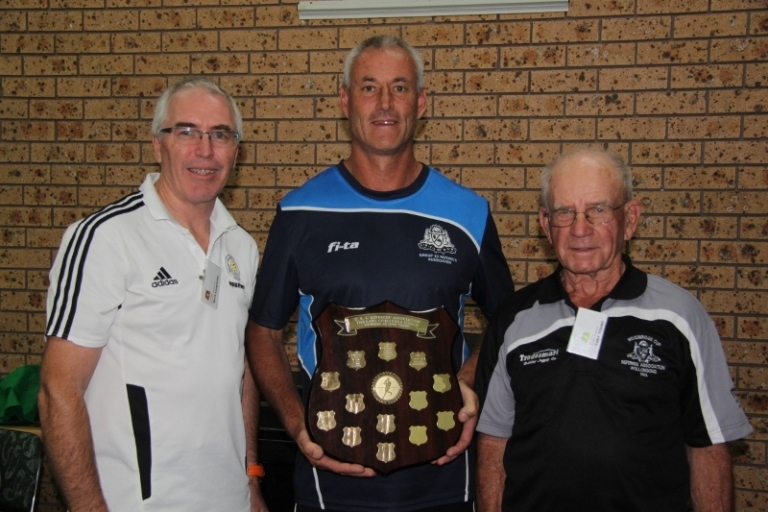 Thank you Shayne for your continued contribution to the CRLRA and refereeing at large. 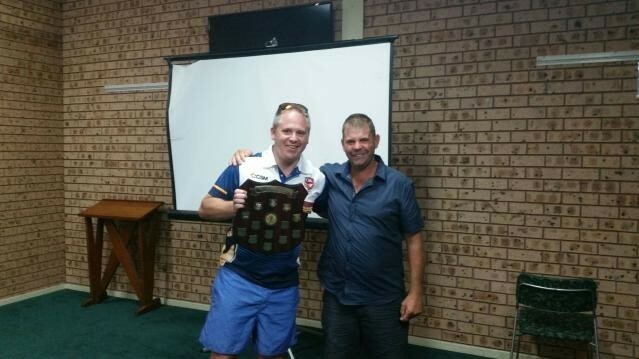 Congratulations to the Group 16 Association for taking out the 2015 "Tony Young Laws Quiz" by a small margin over the Northern Rivers Association and Illawarra. This year's results were extremely close and has showed a significant improvement over previous years. So well done to Skippy, Andrew and the Group 16 team on their success. What a great conclusion to Day 2 of the 2015 CRLRA Seminar with the presentation by truly professional group in Theatre Sports. Various volunteers were selected from the audience (as selected by Steve Clark) to participate in some real life scenarios followed by some valuable discussion moderated by Greg Nicholls and Paul Heptonstall. Former NRL player Justin Poore was on hand to offer some examples from his playing career. An immensely useful session for everyone who attended. A truly inspirational insight to army organisation culture was delivered by today's key note speaker Major General Mick Slater AO DSC CSC. Mick's talk was refreshingly casual and reinforced the topics that had been delivered by earlier speakers. He emphasised that in successful organisations the individuals can make a difference by performing their roles to the highest level they can. In his role he sees around thirty eight thousand ordinary people doing remarkable things and his belief is that all organisations are capable of doing the same. The presentation was well received by all 150 CRLRA people in attendance. Day one of the 2015 CRLRA Annual Seminar at Wollongong has proven to be an amazing success with a record number of participants enjoying the day's activities. 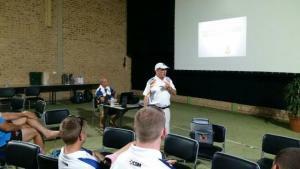 Mostly comprising members of the CRLRA Development Squad and the CRLRA Coaches of Match Officials, the group was kept informed entertained and enlightened all day from the AFP's Mel Sevil commencing proceedings informing of the perils of Social Media. The NRL's Alan Tongue gave the Development Squad a session on Personal Branding while the NRL DO's presented their new document on Coaching Guidelines for 2015. 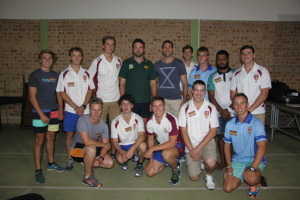 The Cultural Diversity presentation by Billy Williams was both entertaining and informative and Bryan Norrie's talk on his journey from the "Bush to NRL" gave insights to the young group that will be useful for their future. The day's activities concluded with Darryl Durham giving a presentation on Mentoring which will be very useful for both the Development Squad and the CMO's on the audience. Congratulations in particular to Steve Clark of the NRL along with the Refereee Development Officers who organised today's activities. Below is the Agenda for next Saturday's General Meeting. It includes the correspondence list. Also attached is the room list for lectures. If anyone has been left off this list, please let Tony Hardy know when you arrive and you will be allocated a room. Due to the large numbers attending, this list must be adhered to. There will be some lectures where everyone will be combined in either a mix of the long rooms or the Tennis Court area... this will be advised. Ready for the CRLRA Challenge? If you are attending next weekend's CRLRA Seminar at Wollongong? If so, are you ready to take on the Laws Challenge for the coveted "Tony Young Shield" awarded to the best performing Association in the Annual Laws Quiz? If you don't think that you're up to speed with the current laws then you have a week to brush up so you don't let your team down. Previous winners have been Group 2 (2011), Group 10 (2012), Newcastle (2013) and Group 10 (again in 2014). So get out the Law Book and brush the dust off so you can brush up. Good luck! The CRLRA is fortunate to have an amazing Australian as its keynote speaker at the upcoming Annual Seminar on Saturday 31 January. We are honoured to have Major General Mick Slater, AO, DSC, CSC to address our 150 members and guests who will be in attendance. 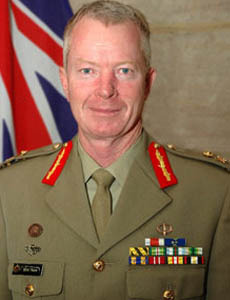 Major General Mick Slater is the Australian Army's Forces Commander. 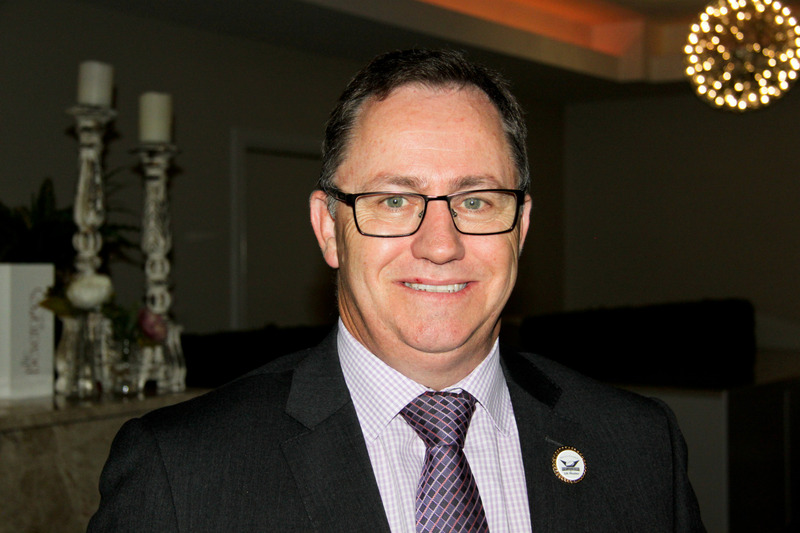 Based in Sydney, he is responsible for the majority of Army units and training establishments throughout Australia. 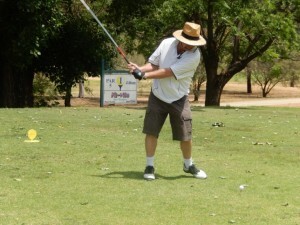 Before joining the Army in 1978 he worked and studied surveying through Queensland University of Technology. Following officer training at the Officer Cadet School Portsea, Major General Slater undertook a variety of infantry regimental and instructional appointments in Australia and overseas. His senior staff appointments have included Director General Preparedness and Plans, Director General Personnel, Director General Intelligence Support to Operations and Head of the Defence Personnel Executive. Major General Slater has commanded at all levels from platoon to division. His operational commands have included the 2nd Battalion, The Royal Australian Regiment during International Force East Timor (INTERFET) in 1999 and he commanded the international stabilisation forces, based on the 3rd Brigade, in Timor Leste in 2006. He also served on the staff of the United States 3rd Army Headquarters in Kuwait on Operation POLLARD. He has undertaken formal education in mobilisation planning in the USA, and is a graduate of Command and Staff College Fort Queenscliff, the Joint Services Staff College, and the United States Army War College. Major General Slater holds Masters' Degrees in Strategic Studies and Business Administration. 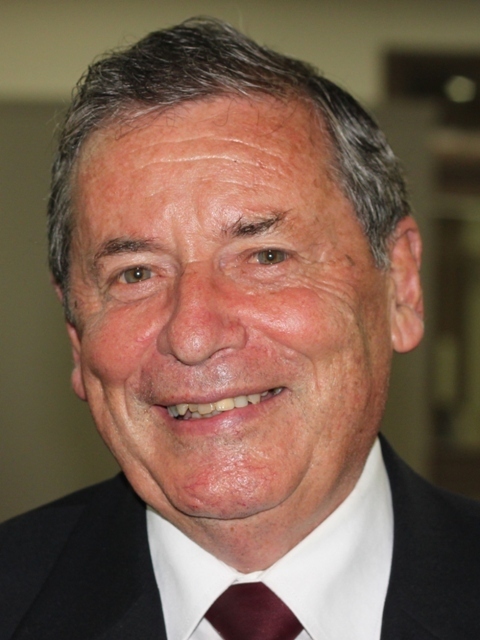 Most recently he was seconded by the Australian Defence Force to the Queensland Government where he was chair of the Board of the Queensland Reconstruction Authority following the state wide devastating floods and cyclones in early 2011. He will be a truly inspirational speaker. The upcoming 2015 CRLRA Seminar to be held at Breakers Resort Wollongong from Friday 30 January to Sunday 1 February is gearing up to be one of the biggest in recent years with a hundred and fifty people to be involved. This includes forty-two of the CRLRA Development Squad members and an impressive number of CRL CMO's (Coaches of Match Officials) who will be attending a CMO re-accreditation course being conducted during the weekend seminar. Exec/RDO's (12), Grp 2 (Nil), Grp 3 (4), Grp 4 (8), Grp 6 (19), Grp 7 (3), Grp 9 (10), Grp 11 (4), Grp 16 (6), Grp 19 (5), Grp 20 (4), Grp 21 (8), Nthn Rivers (13), Central Coast (3), Newcastle (18), Illawarra (10), Woodbridge Cup (7). 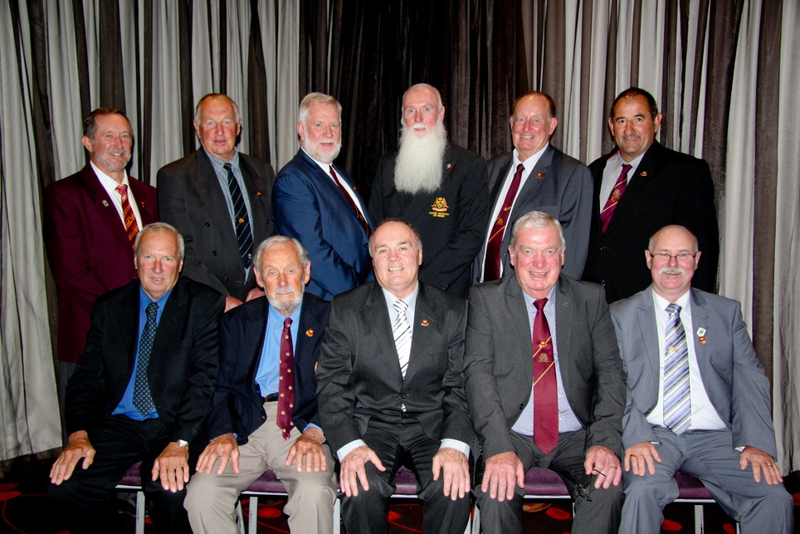 Castlereagh League (1), Life Members/Others (5). Below is the programme for the weekend as well as the Development Squad/CMO Programme for the Friday. 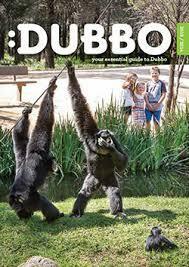 The Executive looks forward to catching up with everyone on the weekend. The Executive of the CRLRA is very pleased to announce the appointment of Luke Potter to the position of Referees Development Officer South East Region replacing Kevin Petty who has relocated out of the area. 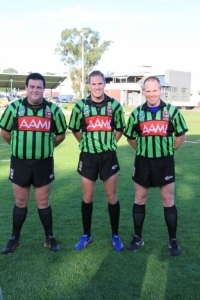 Luke takes up the role after twenty-five years as an active referee rising through the country ranks to NSWRL Junior Reps before being graded in 2004 after controlling the Harold Matthews Cup Grand Final. In 2008 he was drafted into the NRL Match Officials Squad and since then has officiated in 120 NRL fixtures. He is a Level 4 Referee, a Level 2 CMO and holds a certificate IV is Sports Administration. Luke's passion is the development of young referees to realise their fullest potential and hopefully fulfil their dreams. We are fortunate to have him join our ranks and our young referees in the South-East will definitely benefit from his involvement. Luke's contact details can be found in the Development section of this website. The CRLRA Annual Seminar will be held at Breakers Resort Fairy Meadow on Friday 30th January, Saturday 31st January and Sunday 1st February 2015. An extensive programme has been developed with Development Squad Referees and CMOs invited to take part on the Friday. Forms are at the bottom of this item. Development Squad Referees and CMOs are requested to attend the Seminar from Thursday night 29th January. 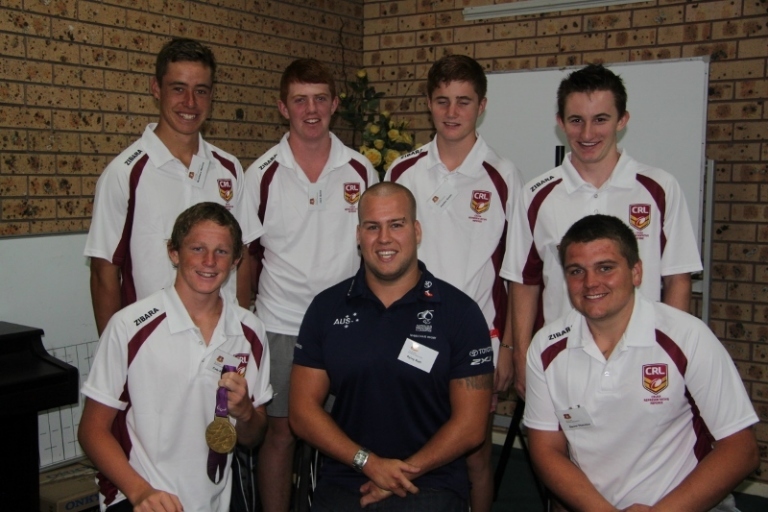 Funding has been provided by the CRL and NRL for this component of our extended programme this year. Our thanks to Steve Clark for his assistance with this. Also to the RDOs, Richard Johnston, Michael Stone and Dennis Spagarino for their input into the weekend programme. 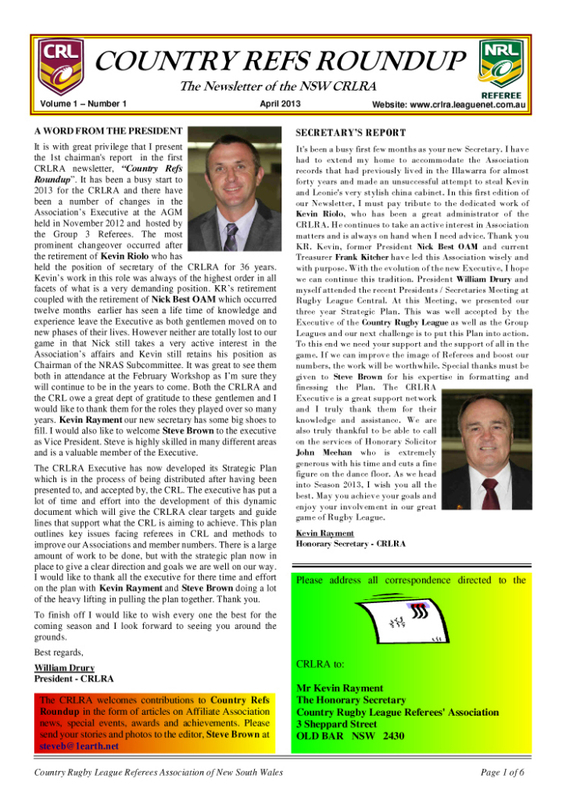 The CRLRA Executive looks forward to seeing you soon. This week saw the end of an era when NRL Referees Shayne Hayne announced his retirement from the big NRL stage. 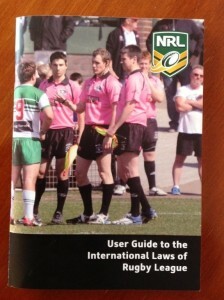 However he will not be lost to the game as he has taken on the role of managing the NRL Referee Emerging Squad. 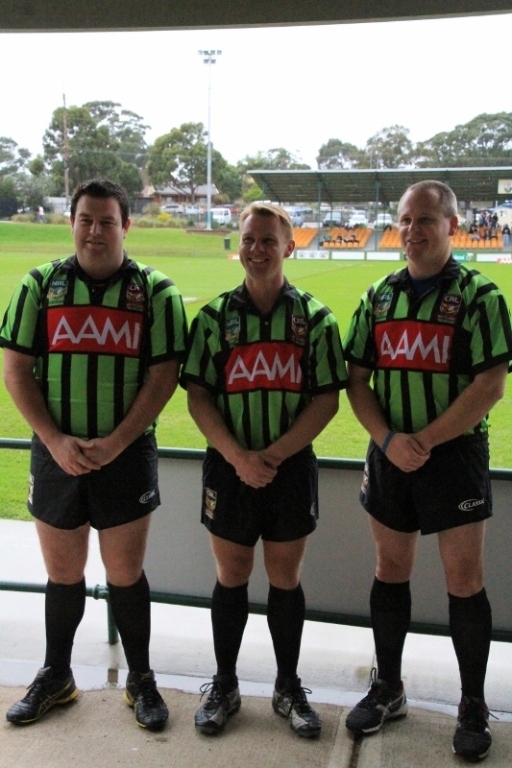 A former CRL player and CRLRA Referee, Shayne has officiated in 328 NRL games, including 4 Grand Finals, 14 State of Origin games and 2 Country V City matches. Even while concentrating on his career at the top level, Shayne has maintained a very strong link to his roots in assisting young up and coming referees in the CRLRA. 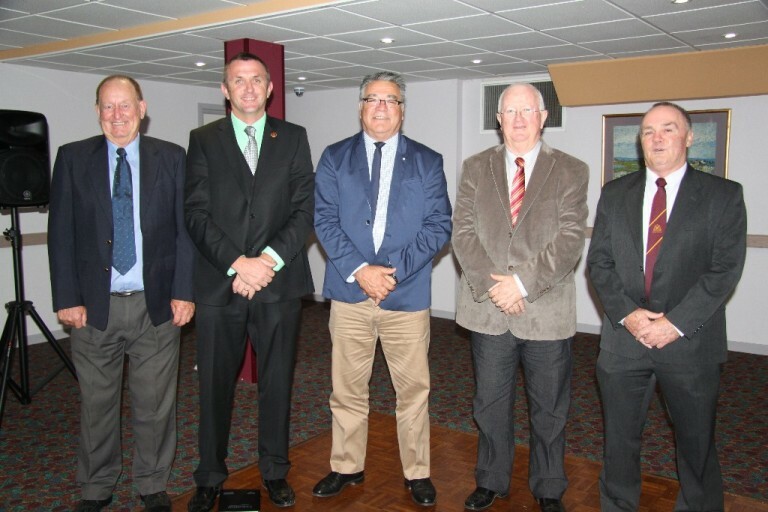 In this capacity he has done most work for the Central Coast Association where he still fills the role of Central Coast Rugby League Director of Referees. Congratulations Shayne on a stellar career and in particular the guidance and example that you have shown our younger match officials in the CRLRA. One of the highlights of this year's AGM at Dubbo was the Barefoot Bowls. Not much skill displayed by most but a lot of fun. 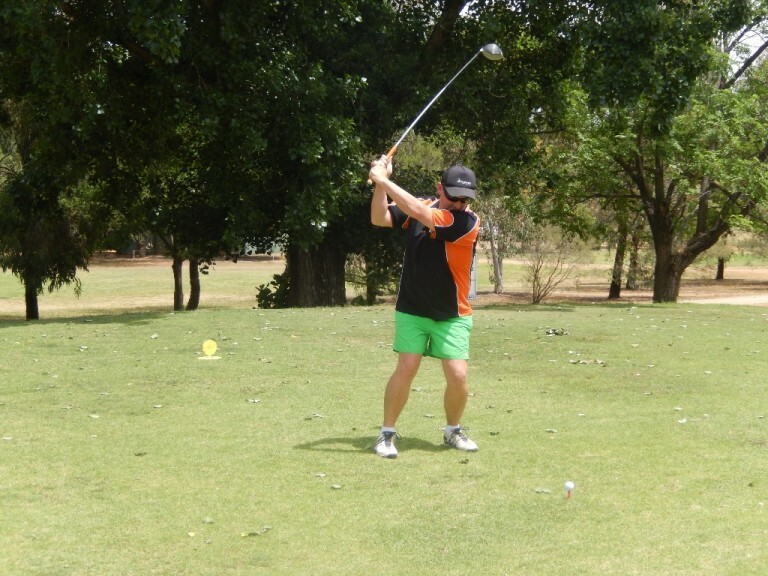 The 2014 CRLRA AGM once again saw the Michael Stone 9 Hole Challenge at the Dubbo Golf Course. This year it looked more like a fashion parade with two teams unexpectedly turning up in colour coordinated "sponsored" gear. The salary cap auditors will definitely be looking into this new gear. 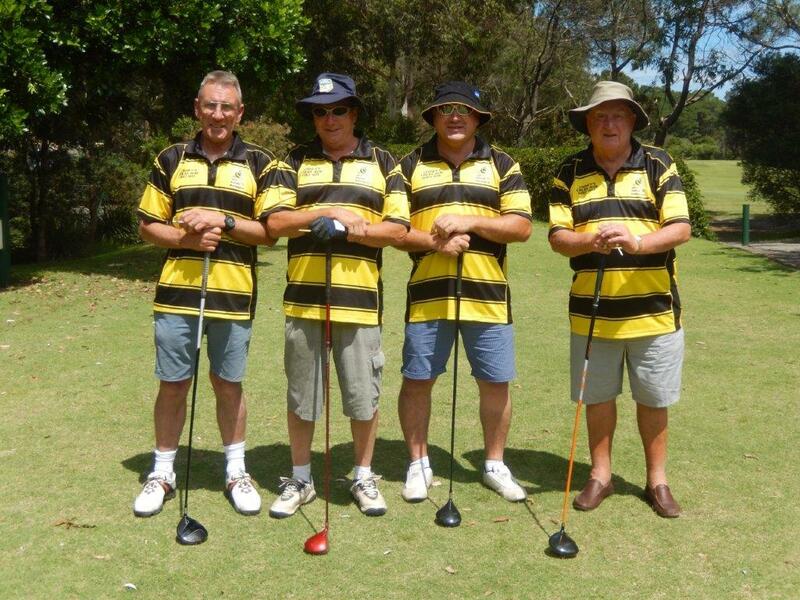 In any case all of that professional looking garb didn't help those two teams with both of them succumbing to the superior golf the "uncoordinated dress" team led around the course by Troy Warner (Gp 11), Steve Toms (NRRLRA), Tony Bannerman (Gp 3) and Mark Stenhouse (Gp 20). At the end of the day Stoney manipulated the scores so that a draw was the result with Pat Walsh winning the day on a draw from the hat. 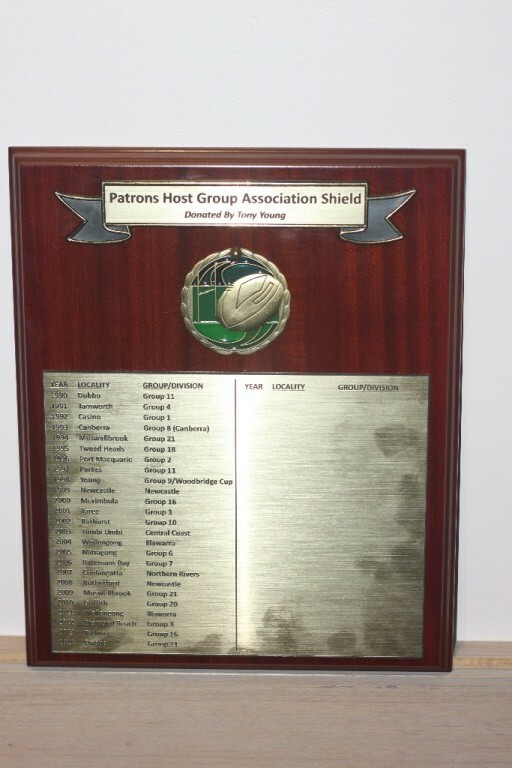 Group XI Referees are the first recipients of the "Patrons Host Group Association Shield" organised and donated by CRLRA Life Member Tony Young. 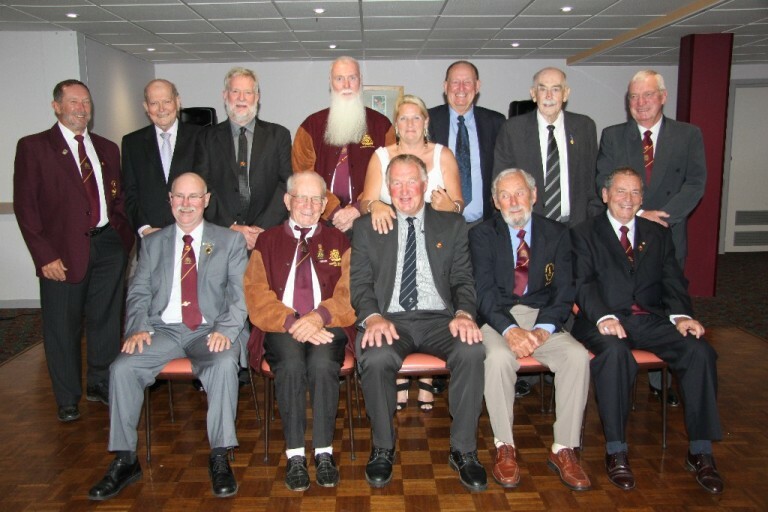 It recognises the Affiliated Association that hosts the AGM and is already engraved with the hosts since 1990 when the event was decentralised and coincidentally it was Group XI who were the hosts in that year twenty-five years ago. 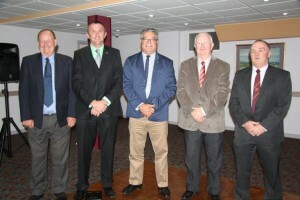 The photos show the new shield and the CRLRA's three Patrons Tony Young, Nick Best and Mick Stone with the Executive of the Group XI Referees Association. 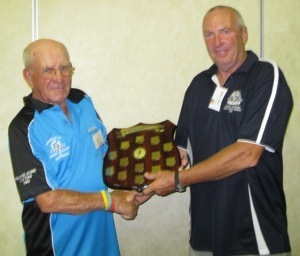 Congratulations to Group 16 Referees stalwart Ray Inskip on being elected as the CRLRA's thirtieth Life Member. 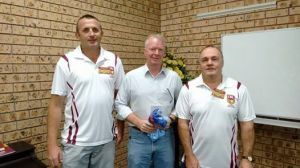 "Skippy's" elevation to Life Membership occurred at this weekend's CRLRA 2014 AGM hosted by the Group XI Referees Association in Dubbo and the award has been widely acclaimed by all in attendance. 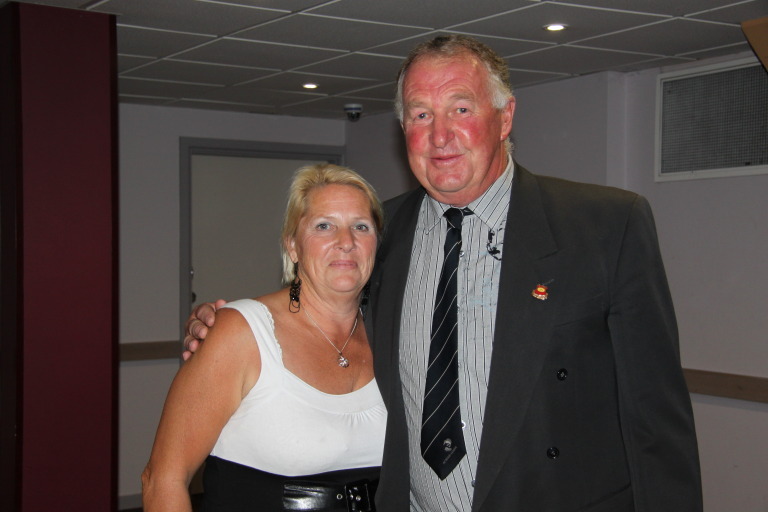 Congratulations to Ray and his charming wife Leonie who can also claim much of the credit for the support that she has shown her husband over his many years of service to refereeing both within his home Association and the CRLRA. 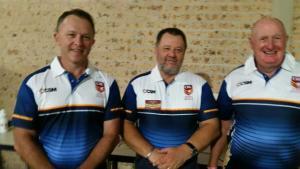 The weekend of 8-10 November saw another very successful CRLRA AGM at Dubbo hosted by the Group XI Referees Association. It was great to see CRLRA Vice-President Doug Harrison and CEO Terry Quinn in attendance along with Steve Clark and Brad Levy from the NRL. The elections saw the previous Executive Committee of the CRLRA returned for another twelve months. Group XI are to be congratulated on hosting a magnificent event. 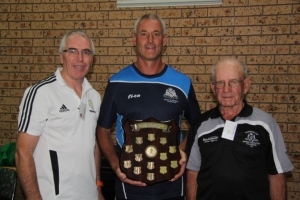 Hard working Illawarra Referees Association Honorary Secretary, Andrew Astill, has won that Association's top honour for 2014 when he was annouinced as the "Ned David" Award winner at the Association's Annual Presentation Night on the weekend. 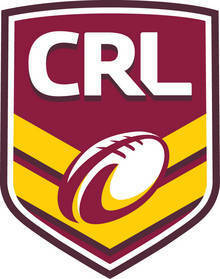 This capped off a great year for Astill who controlled the CRL's Tier 2 Championship Final earlier on. Trophies were also presented to Illawarra's 2014 Representative Rerefees who were Andrew Astill, Phillip Astill and Tyron Jordan. (Photo shows 2014 "Ned david Award" recipient Andrew Astill (right) with Allan Byrnes who was a former Illawarra Referees Secretary from 1956 to 1970). 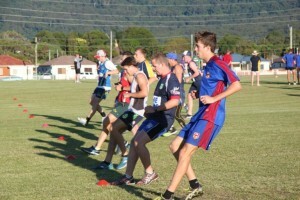 The Inaugural CRL League Tag Premiers Challenge was held in Scone over the weekend of the 11th and 12th October 2014. 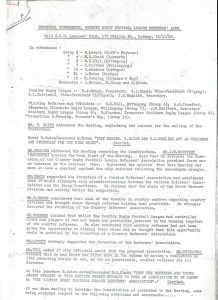 10 referees from various associations within the CRLRA officiated at this inaugural event. Those referees were: - Jordan Mitchell and Mark Goroch (Grp 7). Jayden Smith (Grp 19), Alex Barrett, Stuart Smith and Ryan Schmiedel (Grp 4), Jesse Rutter, Jesse Lear and Jake Davis (Grp 21), Bryce Hotham (Grp 10). All the referees are to be commended on the professional way they performed in extremely hot condition over the weekend and should be very proud of themselves’. In fact their performances were way and above my expectation of them in such stifling conditions which made for a difficult decision to select the referees for the finals on the Sunday. No one really knew what to expect from these games, however, from the very first game is was evident that the standard of the games were going to be of a very high standard, which meant the referees had to step up a level from what they would have been used to, I am very glad to say they did just that. Special thanks to Tony Hardy, Bev Adams and Rod Bowd for their assistance with coaching these referees over the weekend as well as Barry Pratten (Chairman CRL Appointments Board) for his input. Congratulations to all the referees that officiated on contributing to a very successful weekend. 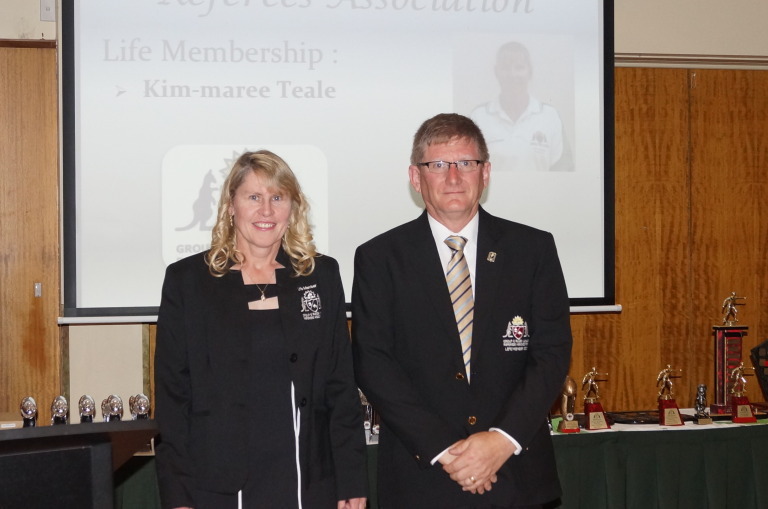 Congratulations to Kim-maree Teale of Group 6 Referees Association on being awarded Life Membership of that body at its Annual Presentation Night held on Saturday 11 October. She becomes the first female to receive the honour within the Group 6 Referees and joins her husband Peter in receiving the award. Congratulations from all in the CRLRA. 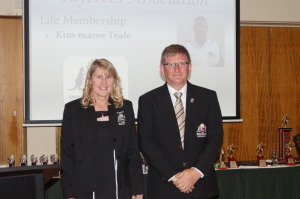 The photo shows Kim-maree with Group 6 Referees President Ray Dwyer. 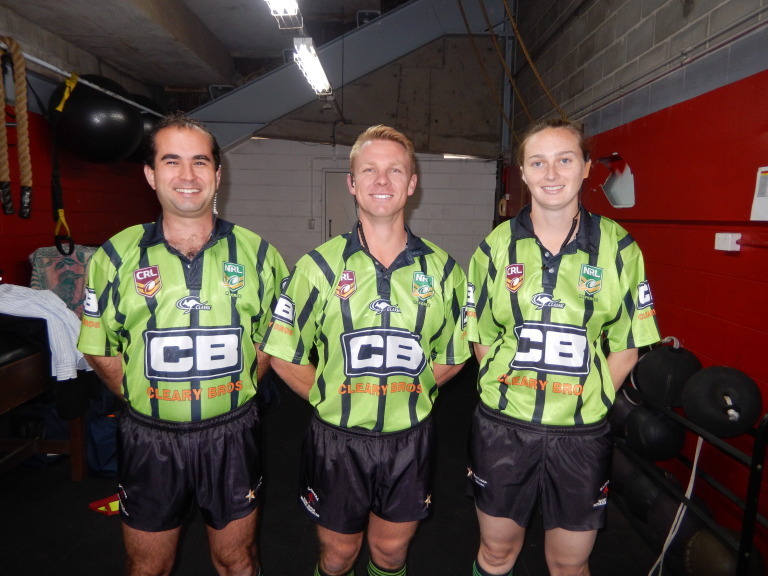 A first for the Group 6 Referees Association occurred when two ladies officiated in the In-Goal at a Grand Final. This year's Under 16A decider saw Tim Sykes in the centre with Joel Broadhead & Mitch Ashkar as touch judges. Supporting them at each end of the field were Madison Ballard & Kim-maree Teale, the youngest & oldest of the Group's 5 female referees). 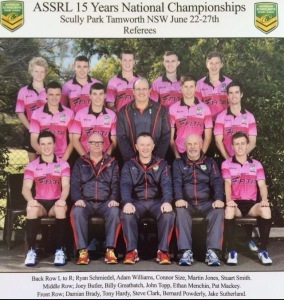 The 2014 Illawarra Division Rugby League Grand Final saw history in the making when referee Marcus Jennett controlled his eighth top grade decider which equalled the record of Jack Coltman who set the record back in 1942. 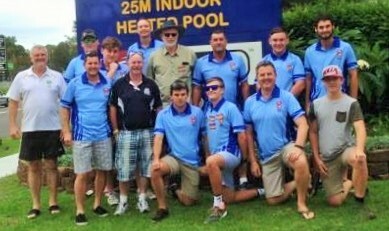 It was a cracker of a game in which the Nathan Fien coached Thirroul ran out winners by 18-16. The Reserve Grade fixture was controlled by Andrew Astill while Andrew Riolo ran out for his twenty-fourth senior Grand Final and blew the whistle for the start of the Colts match. 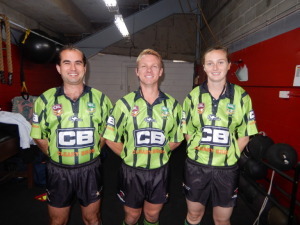 Just a reminder to all CRLRA Referee Associations that the CRL has a direction whereby apparel worn by players and officials (including referees) in any CRL competition MUST be in accordance with the CRL Policy detailed on the CRLNSW website. This means that only CRL Licensed apparel is to be worn by match officials in CRL conducted competitions. It is noted that sometimes we publish photographs of our representative members in gear from non-licensed suppliers but at the time of those photographs they are not participating in a a CRL conducted event. 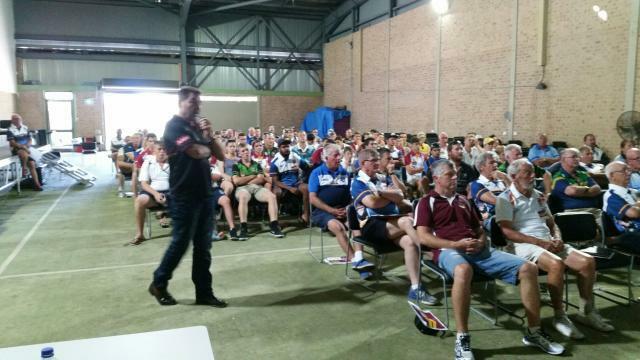 Group 11 Referees Association will be hosting the 2014 CRLRA Annual General Meeting at Dubbo on the weekend of 7th - 9th November. 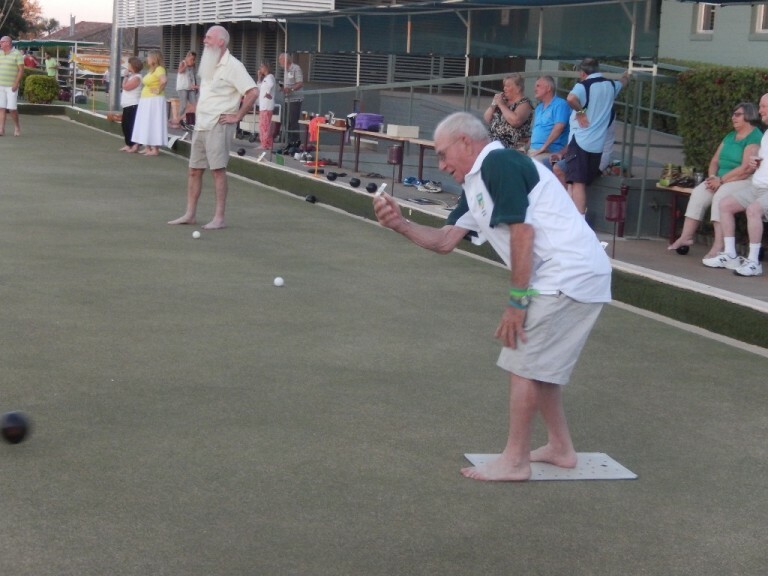 the venue is the Cattleman's Country Motor Inn with the formalities to be conducted at the West Dubbo Bowling Club. Delegates and guests should Click here to download the details. Newcastle Coalfields RA has recently had a first for their Association with what can be considered a pretty unique appointments. 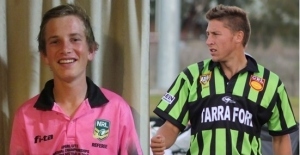 Tom Taylor was appointed to his inaugural Tooheys League First Grade centre in the year that his father, John, is still one of the leading First Grade whistleblowers in that competition. 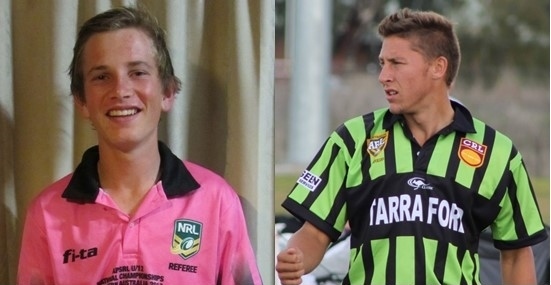 John Taylor has been one of the CRL’s top representative referees for a number of years and it appears that son, Tom, will probably follow in dad’s footsteps. There have been other such “dynasties” in the past where father and son have refereed in the same top grade comp but they are rare. 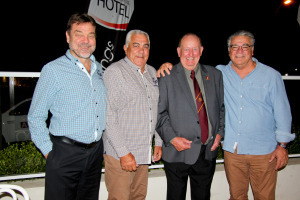 Probably the most famous is a Group 4’s Sutton family with dad, Harold and sons Bernard, Gerry and Chris with the boys all enjoying NRL honours. Photo shows new First Grade referee being presented with his jumper by Referees Manager Gavin West. 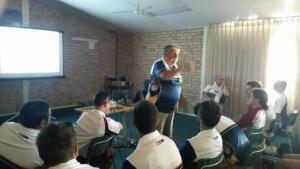 NRL RDO Pat Walsh has once again conducted his Referees Coaching Clinic at Kippax Oval, Belconnen in Holt ACT on the 1st July 2014 with forty up and coming whistleblowers in attendance. 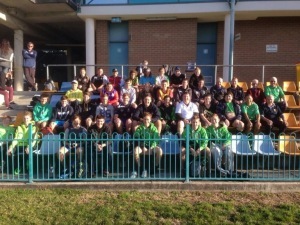 NRL referees Dave Munro and Adam Gee put the forty through drill sessions throughout the day with participants coming from all areas, Groups 6, 8, 9, 16 and Woodbridge Cup. A big thank you to all the helpers who also came along as well as Kevin Forde, Frank Leonard, Tony Young and Willy Barnes. 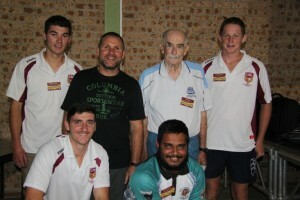 There were also four Game Development Officers from the NRL who helped out on the day. A BBQ lunch was provided as well as tee shirts given out at no cost to those who attended. 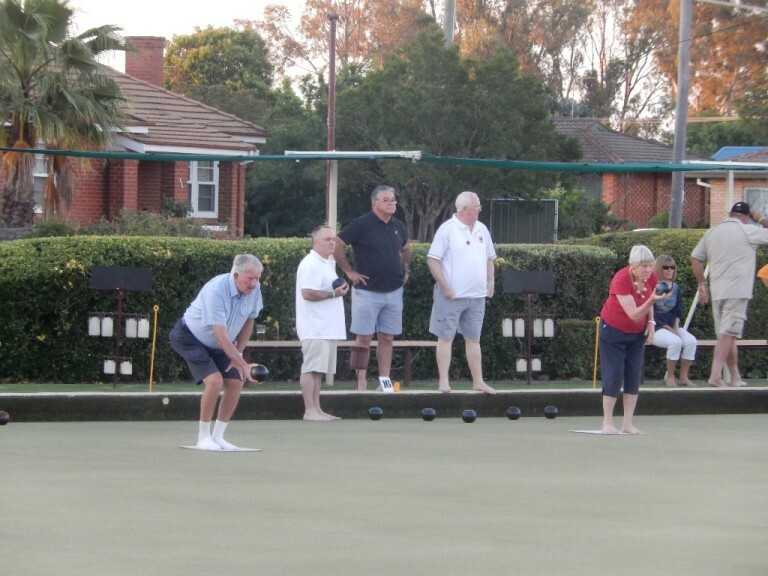 A big thank you to the West Belconnen Leagues Club for once again allowing us the use of their grounds and BBQ area. The CRLRA has once again been represented at the National Schools Championships by some exceptional young match officials. 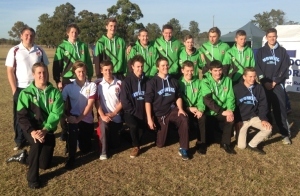 In the ASSRL Under 15’s conducted in Tamworth in June the CRLRA contingent comprised Joey Butler of Group 21 and Jake Sutherland of Central Coast RA. 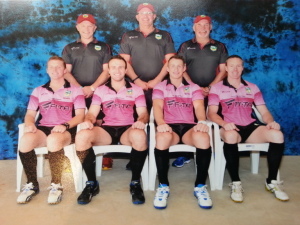 Picture shows:-Back Row: Ryan Shmiedel, Asam Williams, Connor Size, Martin Jones, Stuart Smith. 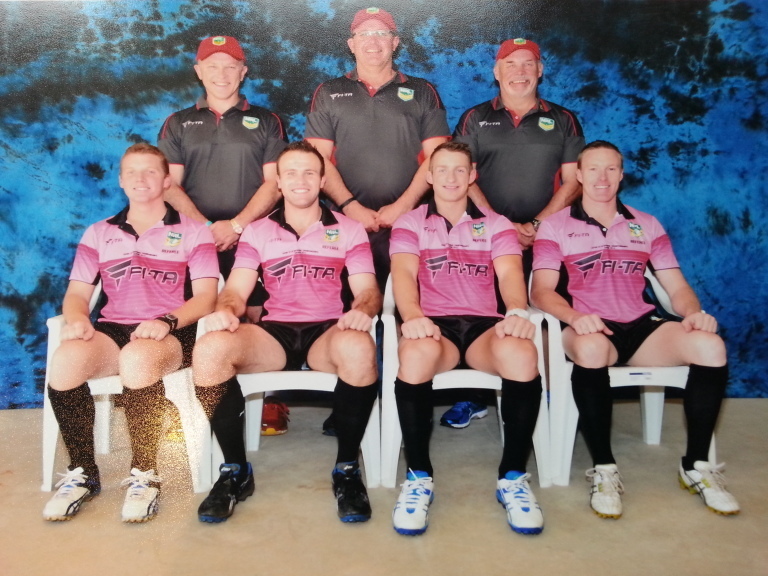 Middle Row: Joey Butler, Billy Greatbatch, John Topp, Ethan Menchin, Pat Mackey. 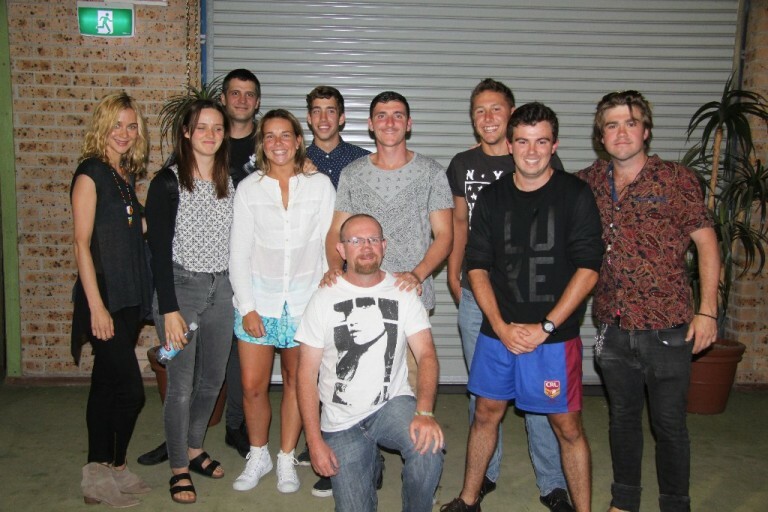 July saw another successful Referee Exchange between the CRLRA and The NZ Referees with Newcastle Coalfields RA hosting the Kiwi visitor and sending one of their own to the Land of the Long White Cloud. 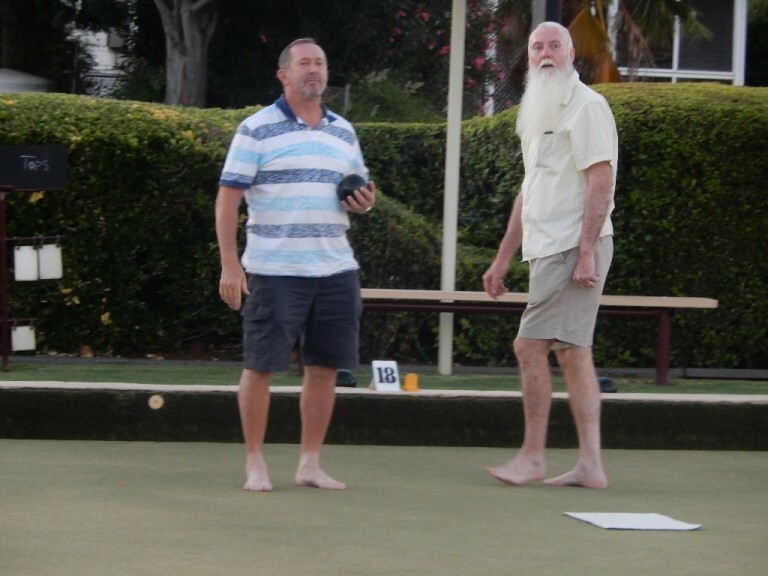 Novocastrian Ryan Walters ventured to the Shaky Isles while Aaron Kesha was wined, dined and whistled by the Newcastle crew who all enjoyed his company both on and off the field. The following report has been provided by Mat Treneman of Group 7 RA who was the CRLRA’s representative at the recent ASSRL Under 18 Championships. Congratulations to Mat who was judged the top on-field official by being awarded the Final. 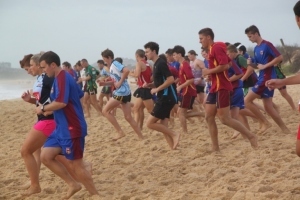 “The U/18’s Australian Secondary School boys Carnival was held in Darwin, between the 6th to 11th July. The games were played in the late afternoon and evening which allowed us an opportunity to do some sightseeing during the day. This included Spectacular Jumping Crocodile Cruises and attending Crocosaurus Cove. Every morning the group completed a rehab session in the pool followed by a light walk. 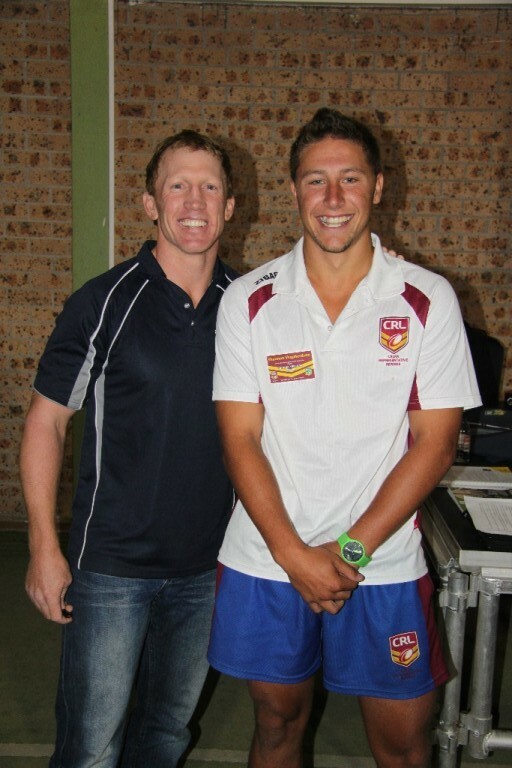 My first game was on Monday, NSW CIS vs QLD which QLD won 0-54. On the Tuesday night we attended a formal dinner with the players, where Andrew Ryan and Dean Widders were guest speakers. 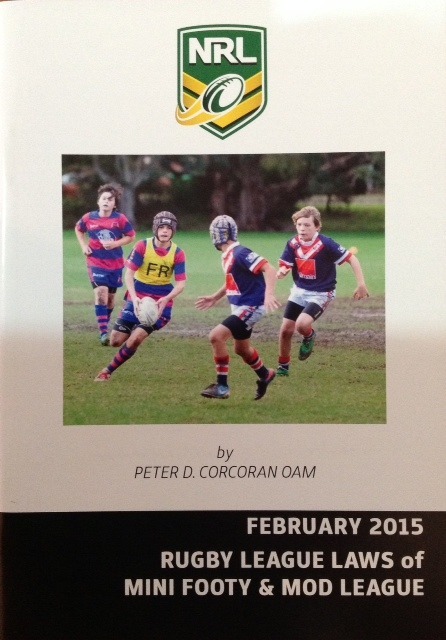 Wednesday night I controlled the semi final between QLD vs NSW CHS, which NSW CHS won 28-14. The two sides played a quick and intense game. The final was played on Friday between NSW CCC and NSW CHS, which I was lucky enough to control. NSW CCC won 19-10 in a quick, intense and free flowing game. 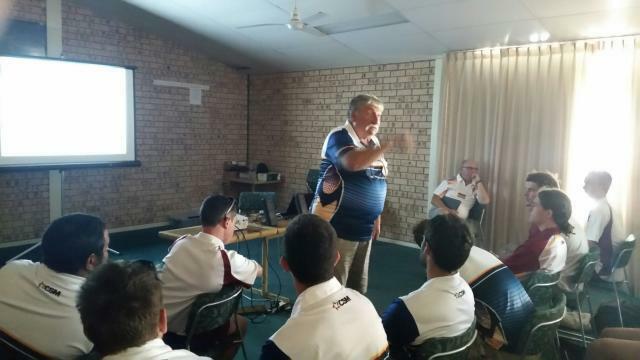 NRL Referee Development Officer, Willy Barnes, took on one of his usual initiatives recently when he decided to take a Development Clinic to the Central West city of Dubbo for presentation to the members of the Group 10 and Group 11 Referees Associations. Unfortunately, after he had put all of the preparations into place he was not able to attend the actual day due to the very sad loss of his mother for which all in the CRLRA send their deepest condolences. 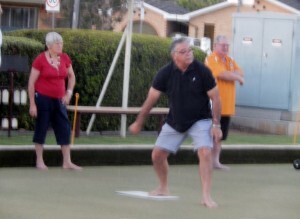 But in typical Willy form and commitment he organised for his fellow RDO’s Pat Walsh and Tony Hardy to conduct the Clinic in his absence along with his good friend Ronny Gibbs. 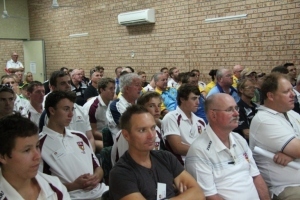 This was the first time a Referees Coaching Clinic was held in Dubbo and the organisers were keen to see how successful it was going to be. 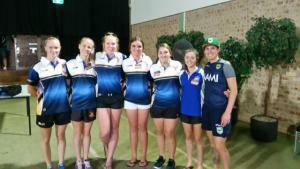 Two NRL Referees attended the day in Jarrod Maxwell and Chris James, and they were well received by the eighteen participants. Jarrod and Chris split the group into two and put them through a host of different drills and skill development sessions throughout the day. Once again lunch was provided and tee shirts handed out to those who attended at no cost to them. The feedback that was received from the day’s attendees was they cannot wait until next year’s event. 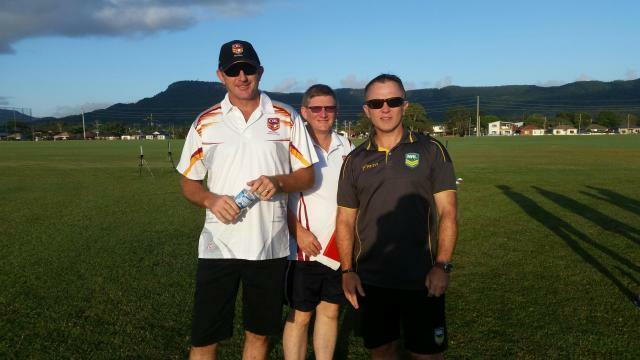 CRLRA President William Drury and Deputy Chairman Kevin Forde attended and met with all of the referees. Also covered on the day was a session on Social Media problems that can result in young Referees getting themselves into trouble. Chris and Jarrod gave their views on this topic as well. 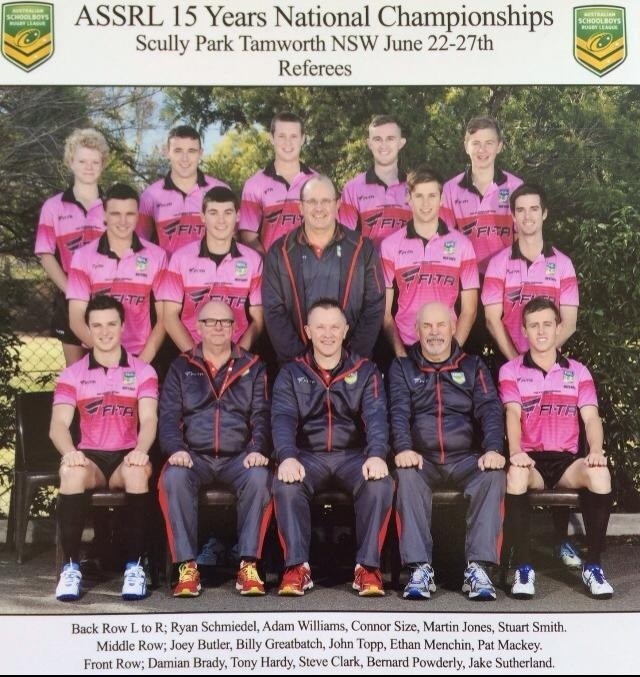 Once again 2014 saw a fantastic contingent of CRLRA referees feature in the NSWRL All-Schools Knockout held at various grounds around the western suburbs of Sydney with a continuation of the success of last year where CRLRA officials controlled twelve of the fifteen finals on offer. 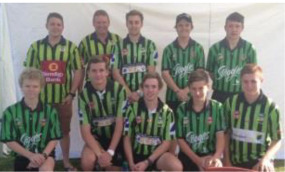 Well this year Country referees were appointed to nine of the fifteen with a former CRLRA referee in Lachlan Wild who has joined Canberra Referees doing one of the six remaining games. 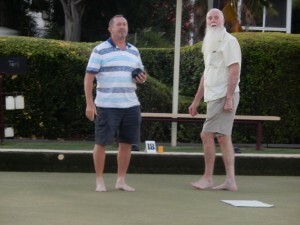 The NZ Referees in attendance accounted for another two of the matches. Also in attendance at the Championships were fourteen CRLRA Referee Coaches and these are all listed below after the roll call of referees. Congratulations to all who participated from Country. Once again you have shown that our development programmes are bearing fruit and we are producing some of the best young referees in NSW. Bev Adams(4), Graham Watson(6), Graeme Priest(Central Coast), Kevin Forde (CRLRA), Nick Lander(10), Rod Bowd(21), Mark Edwards (CRLRA), Phil Dawes(6), Kevin Petty(CRLRADO), Peter Teale(6), Wayne Wilson (CRLRADO), Tony Hardy (NRLDO), Pat Walsh (NRLDO) and Willy Barnes (NRLDO). 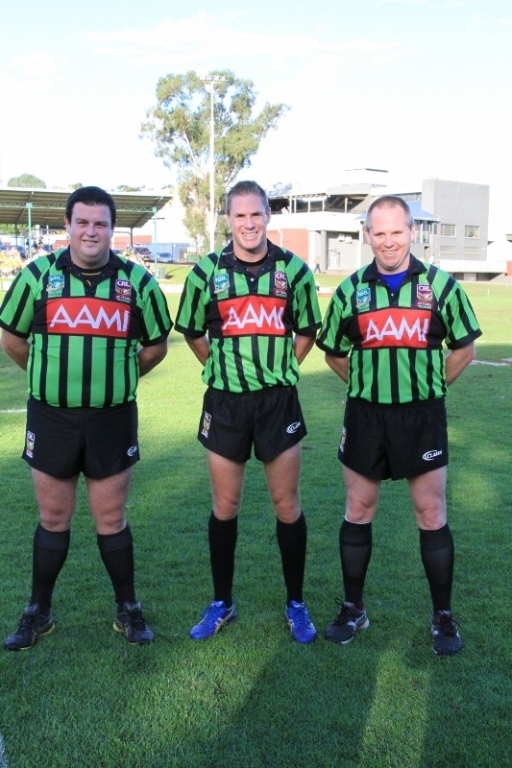 The CRL Appointments Board has selected the referees to control the 2014 Championships Finals to be held at Scully Park, Tamworth on Saturday 21st June. The CRLRA has selected Divisional representative and Group 7 referee, Mat Treneman, to represent it at the 2014 Australian Secondary Schools Rugby League Under 18 National Championships which will be held in Darwin from 5th to 11th July. Mat has a history of representing the CRLRA in prestigious events including the CRL Championships series, the ASSRL Under 15 Championships in Adelaide in 2009 and in 2013 represented us in the NZ Exchange. His on-field performances are only one element of why he has been chosen for these honours, the other being his oustanding skills as a great ambassador of the CRLRA, refereeing as a whole and rugby league in general. Congratulations Mat as you embark on officiating in matches involving the most outstanding rugby league talent in the country. 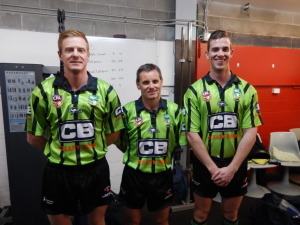 The CRLRA will once again undertake a referee exchange with our friends across the Tasman with The Executive choosing Ryan Walters of the Newcastle Coalfields Referees Association. The exchange will occur in the period 11th to 20th July and whilst Ryan is busy officiating in the Land of the Long White Cloud, one of the New Zealand members will be hosted by the Newcastle Referees and will participate in matches in that division. This exchange has been in place for many years and all of the referees who have had the opportunity to participate have spoken about ity in glowing terms especially in relation to the camaraderie and long term friendships that have resulted. 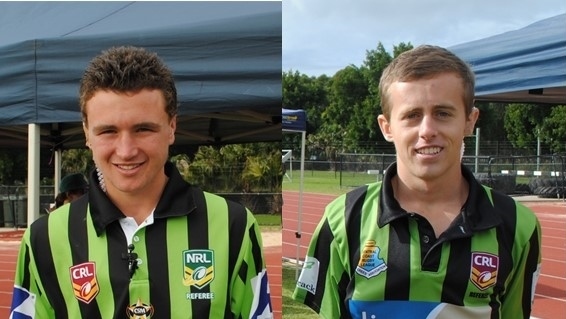 The CRLRA Executive has announced the two referees who will represent the Association at the upcoming Australian Secondary Schools Rugby League National Under 15 Championships to be held in Tamworth from the 21st to the 27th of June. 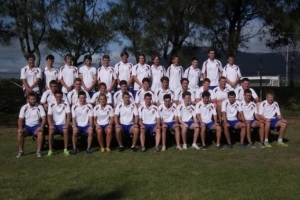 The two were selected after their outstanding performances at the 2014 CRL Under 16 and Under 18 Championships held at Figtree over the Queen's Birthday Long Weekend. The two successful whistleblowers are Joey Butler (shown left) of the Group 21 Referees Association and Jake Sutherland (shown right) of the Central Coast Referees Association. The Executive of the CRLRA along with all of the Association's affiliates congratulate these two fine young referees and wish them all the best in what will be a fantastic experience. 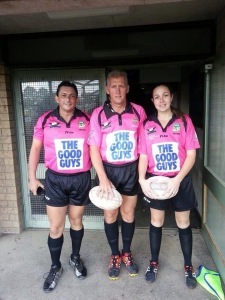 The weekend of 24-25 May 2014 saw two of the Country Rugby League Referees Association’s younger referees step up and control their first ever top grade games at the opposite ends of the state. What makes this such a significant event is that they are still in their teens and both are recognized as having enormous potential to go on to bigger and better things. On the Saturday, seventeen year old Shannon Shepherdson (shown on right above) of the Group 16 Referees blew the whistle for his initial First Grade fixture featuring Bega v Narooma which Bega won 38-30. It was a good quality fast game and both teams are reported to have enjoyed playing under the control of the young whistleblower. Spectators also reported that Shannon performed well and appeared to have the respect of the players. 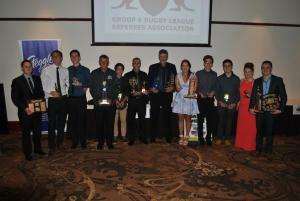 This caps a terrific couple of years for Shannon who represented the CRLRA in the 2013 Primary Exchange (Under 12’s) conducted by School Sport Australia in Perth where he learned much under the guidance of NRL Referees Development Manager, Steve Clark. 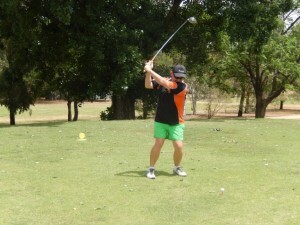 He also earned a CRL appointment in the 2013 Under 14 and Under 16 Championships. The very next day, the CRLRA’s other representative in the 2013 Primary Exchange in eighteen year old Garth Burley (shown on left above) of Group 2 Referees followed up Shannon’s celebration when he ran out onto Frank McGuren Park at Grafton to officiate in the centre when the Grafton Ghosts A Grade hosted the Orara Valley Axemen. 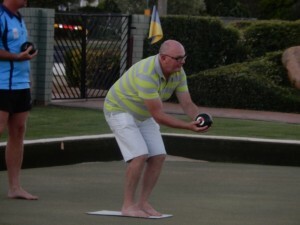 Once again young Garth showed all the skills of a seasoned professional in controlling what turned out to be a one-sided affair but he still thoroughly enjoyed the experience. 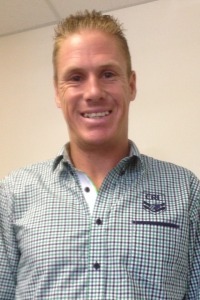 Garth is in his fifth year of refereeing having taken it up to remain in the game when he decided that he wasn’t going to be big enough to compete as a player. He has taken every opportunity to develop his refereeing skills, often at his own expense when required to travel to the major centres from his home in Dorrigo where he played from Under 10 to Under 14 before taking up the whistle. 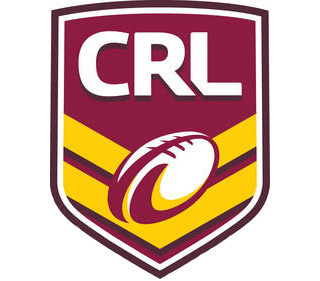 Once again, this caps off a significant period in young Garth’s refereeing career having been appointed to CRL junior fixtures in 2013 including the appointment to control the Under 14 Trophy Final. The CRLRA is rightly proud of these two young match officials just as it is of all of the young ones who are taking up the refereeing challenge. They will definitely go on to higher appointments just like those many former CRL referees who are in the current NRL squad. The first 2014 edition of the CRLRA Newsletter "CRL Refs Roundup" has been released and obtains a host of information about what is happening in the world of the NSW Country Referees. 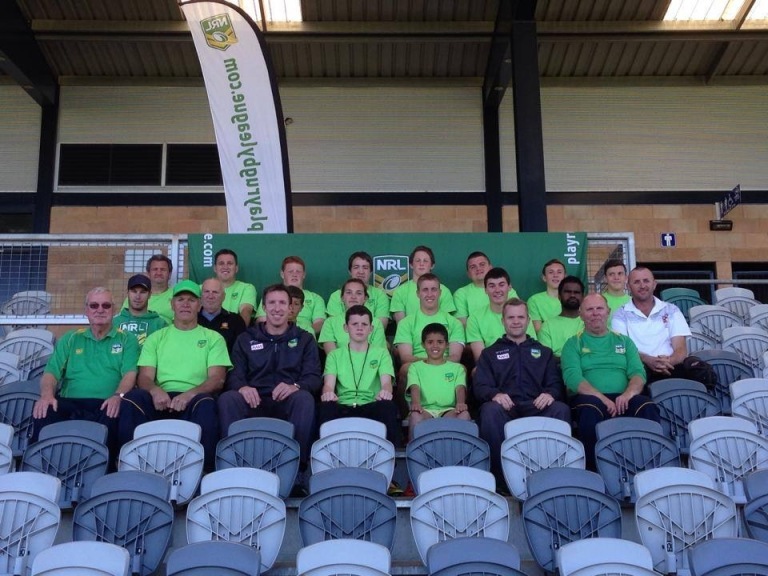 NRL Referee Development Unit in conjunction with the NRL Referees will be holding a coaching clininc. This will be an opportunity for the newer referee and those with only a couple of years experience to come and talk to some of the leading NRL referees and to have them pass on tips regarding practical refereeing. Here is an opportunity to come along to this clinic and pick the brains of the best referees in the country. Cost: Free. Includes lunch and a t-shirt. The 2014 Australia Day Honours List saw former long term CRLRA Honorary Secretary Kevin Riolo named as a recipient of an Order of Australia Medal for his services to Rugby League. Kevin stood down as Secretary two years ago after what seems like a lifetime in the role. 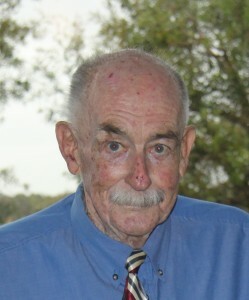 Added to that was his significant contribution to his home Association (Illawarra), his chairmanship of the National Refereeing Accreditation Scheme, membership of the ARLRA Board and the Board of management of Illawarra Rugby League and you have the reasons behind his recognition for this elite award. All in rugby league and refereeing circles around Australia were not surprised to see Kevin receive this honour and in particular the proudest of all was wife Leonie who has travelled the significant distance of years with him. All CRLRA members offer their sincerest congratulations. 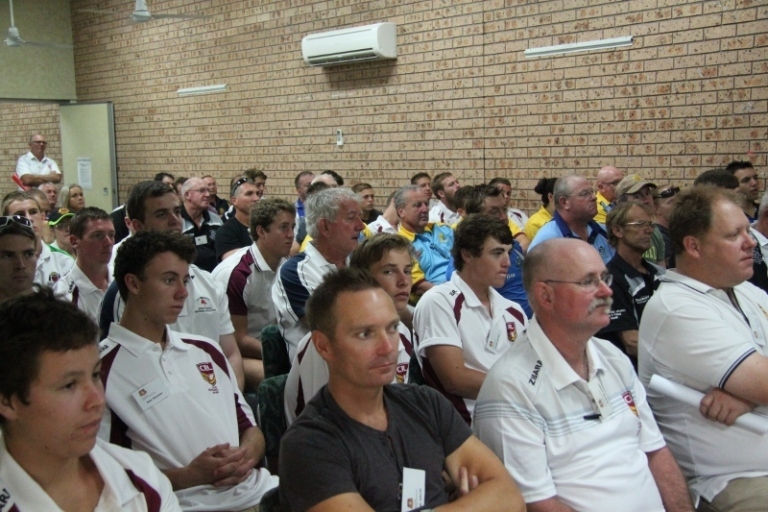 The 2014 CRLRA Annual Seminar conducted at the Surf Leisure Resort on the weekend of 31 January to 2 February was one of the most successful for a number of years with over 130 members in attendance including 38 Development Squad members. 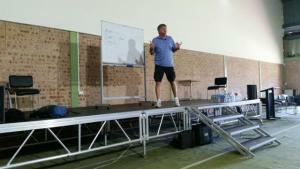 The weekend was packed with educational and interesting topics with a theme of “Stop Whingeing..Let’s Get On With It”. Presenters included the key-note speaker, Ryley Batt, a gold medal winning member of the Australian Paralympics Wheelchair Rugby Team, CRLRA CEO Terry Quinn, Mick Stone, Richard Johnston, David Jay, NRL referees Matt Cecchin, Ashley Klein, Ben Cummins and Chris James, CRLRA Lawyer, John Meehan, former NRL Referee Detective Inspector, Paul Simpkins as well as NRL and CRLRA Development Officers, Willy Barnes, Tony Hardy, Kevin Petty, Steve Toms, Pat Walsh and Wayne Wilson. Congratulations to the organisers, presenters and attendees for such a great weekend. 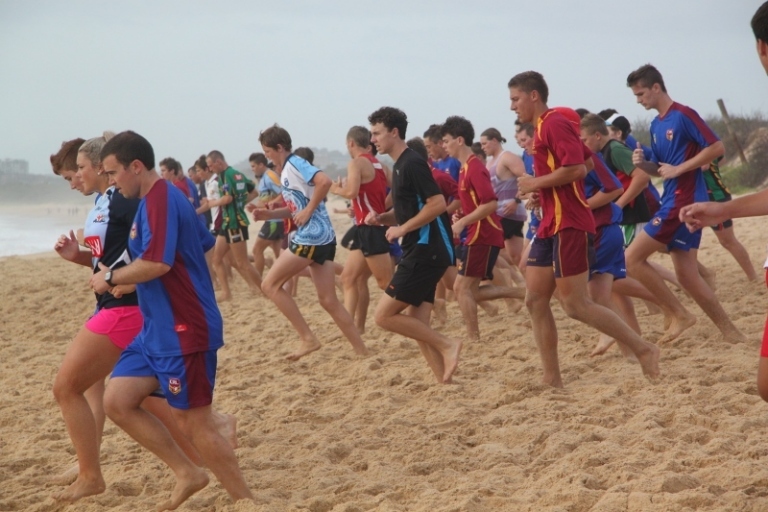 The 2013 CRLRA AGM was this year hosted by the Group 16 Referees Association at beautiful Tathra Beach and it was a roaring success. As well as the usual Welcome BBQ (which was first introduced by the Group 16 Referees when they last hosted this event), the weekend included the Michael Stone Golf Challenge, a trip to the Bega Cheese Factory for the partners of the delegates and a wonderful dinner at the Surf Club on the Saturday night. The CRLRA Executive and its Affiliate Delegates extend their sincerest thanks to the Group 16 Referees for providing such a great weekend, particulary President Ray Inskip, his wife Leonie and their daughter Melissa, Andrew D'Arnay, Ray Ryan, Michael Haigh and all of the rest of their band of tireless helpers. 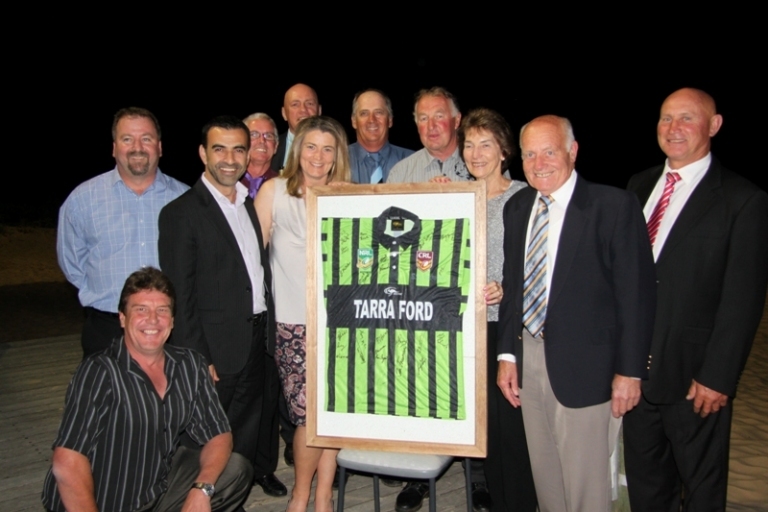 It was great to see the attendance of Group 16 Referees' long time sponsors Tara Ford at the Saturday night dinner where they were presented with a signed and framed referees jumper in appreciation of their tremendous support to the local whistleblowers. It was also great to see so many of the CRLRA's Life Members in attendance which gave us the opportunity to get a snap of the twelve who were there. 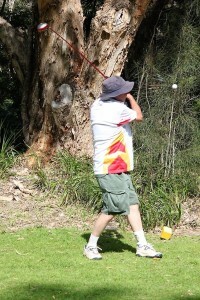 For more photos of the weekend's activities go to our Photo Gallery. 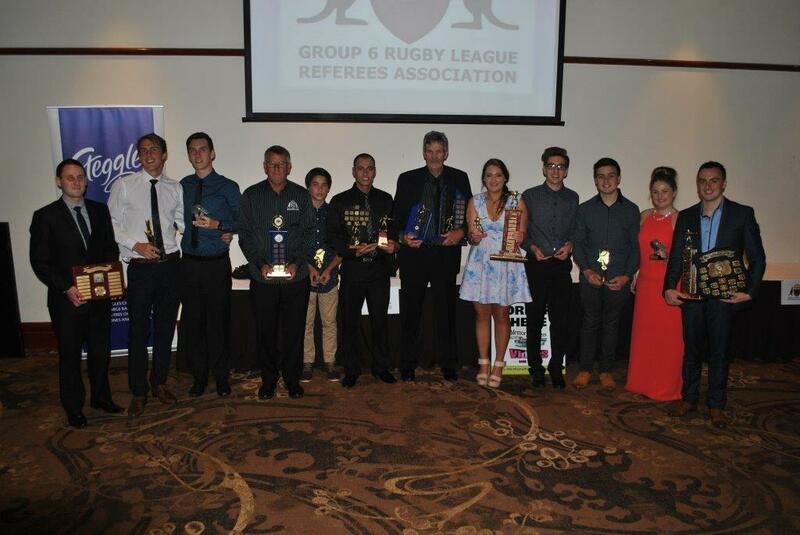 Illawarra Referees coach, Jim Hawker, has won the prestigious NSWRLRA Dennis Braybrook Award for services to Junior Referee Development. It caps a tremendous year for Jim who only a fornight earlier was awarded Life Membership by the Illawarra Association. Jim's dedication and commitment to younger referees in the Illawarra Rugby League is invaluable and he is one of a number of Illawarra members who go out of their way to ensure that their newer members are nurtured and protected. 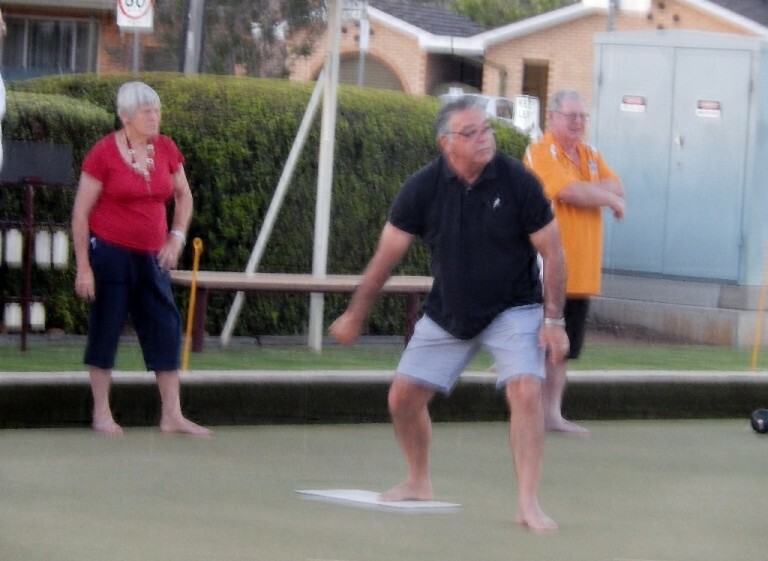 He is the first recipient of this award from the Illawarra Association and all of its members are justifiably proud of him and his efforts over the past five years since returning to the game after a thirteen year absence. 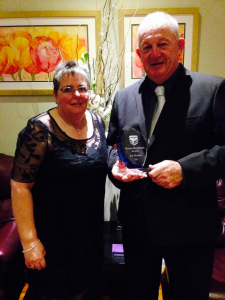 (Photo shows Jim and his wife, Marie, with his Dennis Braybrook Award). 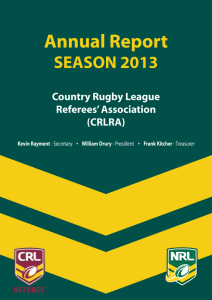 The Executive of the NSW Country Rugby League Referees' Association has released its 2013 Annual Report in advance of its AGM to be hosted by Group 16 Referees' Association at Tathra on the weekend of 8-10 November 2013. Click here to download a copy of the CRLRA 2013 Annual report. 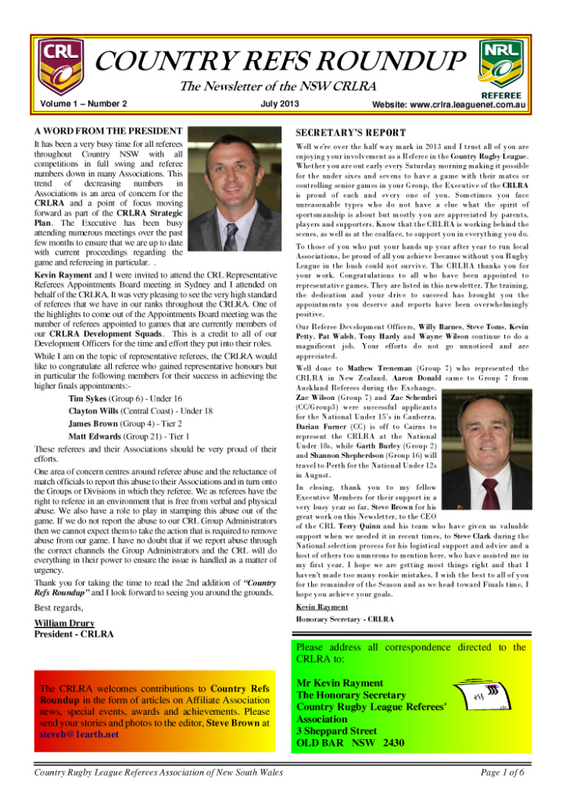 The second edition of the CRLRA Newsletter "CRL Refs Roundup" has been released and obtains a host of information about what is happening in the world of the NSW Country Referees. A Quick Lawsuiz from Richard Johnston. 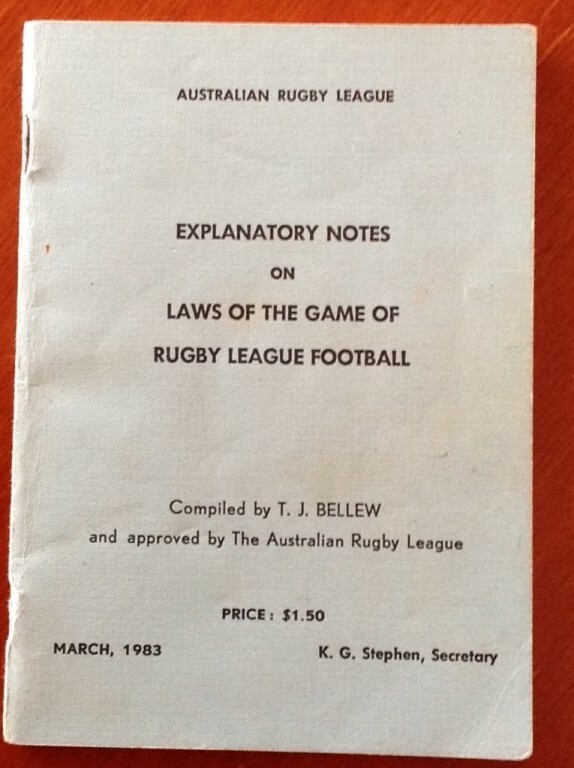 Have you ever wanted to know why the Country Rugby League Referees' Association was first set up or when it was done and who was involved? Also, it is interesting to see who was on the first Executive. Well, the minutes of that very first meeting held in Sydney on 13 November 1938 will answer those questions. Click here to download a copy. 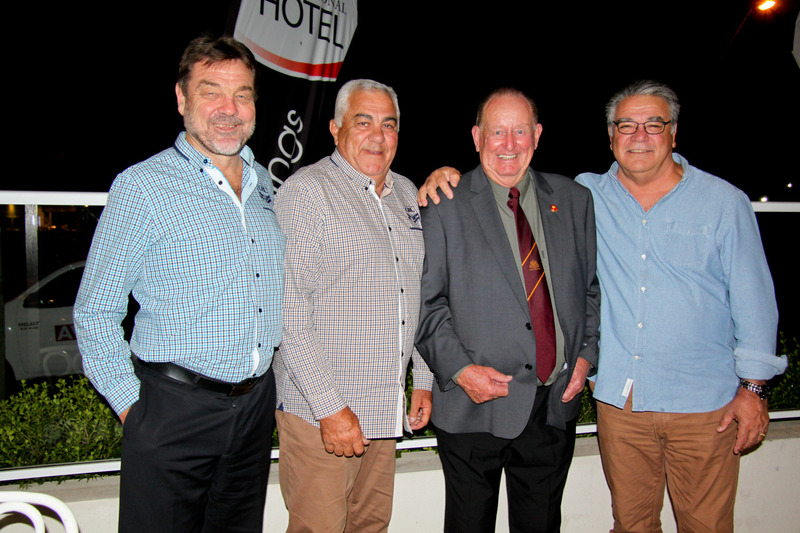 The BHP Billiton Mt Arthur Coal Hunter Valley Group 21 Rugby League held their Annual Dinner after last Sunday’s grand final at Scone. 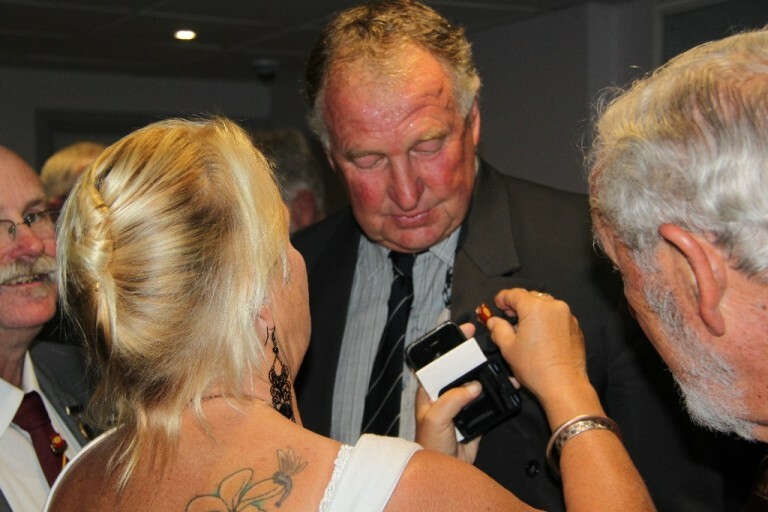 During the presentations on the night Rod Bowd, well known referee in Group 21 and in rugby league circles was presented with a Country Rugby League Merit Award. This award is for untiring service, involvement and support in the development and well being of the Country Rugby Football League of NSW. 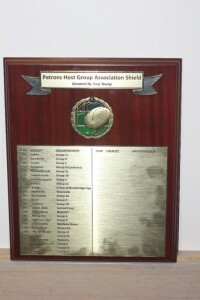 This is one of the highest awards that are given by Country Rugby League. There has been only 108 Merit Award that have been presented to recipients in country NSW. 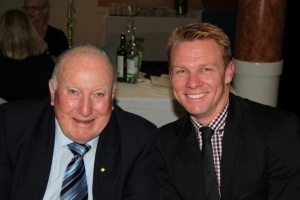 Jesse Dial and Neil Barry are two people that have previously been awarded this honour. Rod has been involved in rugby league in various capacities for the past 35 years. Most of that time has been as a referee in junior and senior league, but over the years he has been a player, Association secretary for 16 years, Scone Junior League President for 2 years, delegate to Group 21 senior and junior league committees, Group 21 Management Committee, Group 21 Development Panel member, Northern Division delegate, Central Hunter Power delegate, Country Rugby League delegate and Country Rugby League Referees’ Association delegate. Rod has attended all junior league grounds this year assessing new referees and offering guidance on how to improve their performance to make them a better referee as well as still being an active referee in senior league. 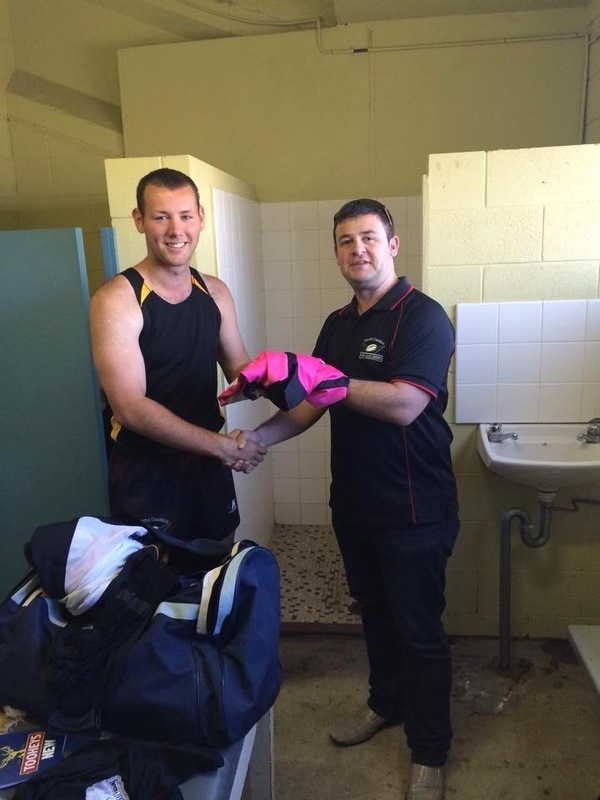 He has been a first grade referee for many years and received his level 3 referee certificate in 2007. 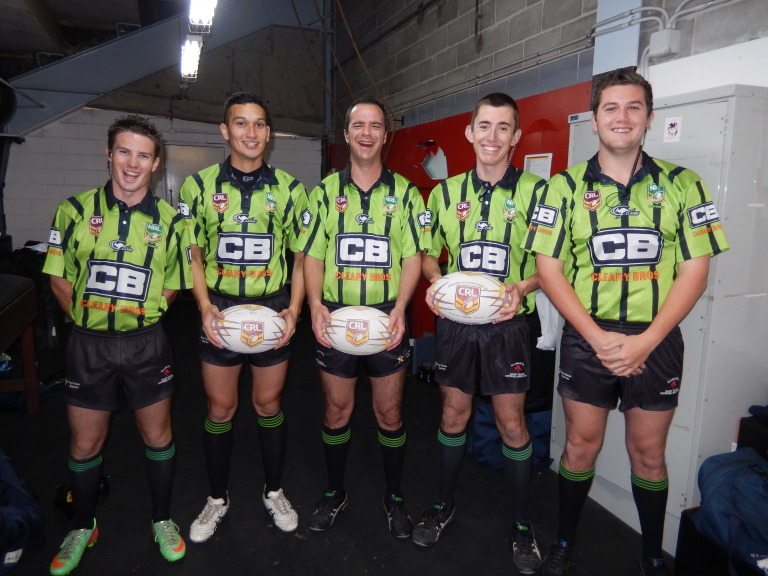 During the year Group 21 Referees have represented their local Association at higher levels of Rugby League. 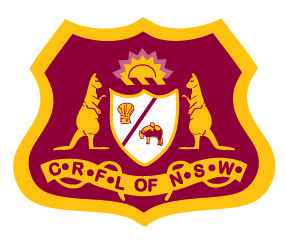 Matt Edwards had been appointed to a CRL first grade match that was played at Scone and the Country NSW v Country Qld match at Uralla. Liam Parker and Michael Hedges were appointed to 15/16s CRL junior league country champions that were played at Forster and came away with refereeing the finals at that venue. 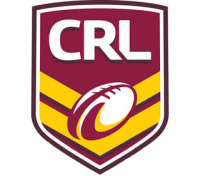 Joey Butler and Roxley Duggan were also appointed to the 13/14s CRL country championships at Inverell where their performances were highly rated. 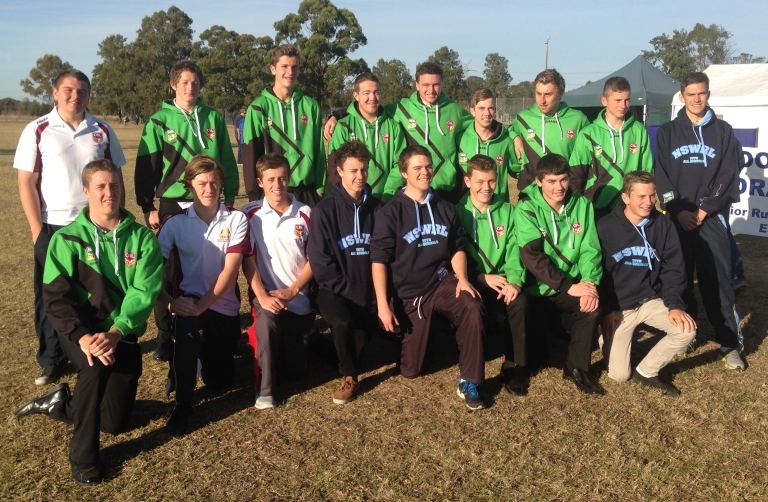 Young referee Joey Butler refereed at the NSW All Schools carnival held in Sydney in early August and received the final of the Open Primary B game, a touch line on the Tuesday in the 13s final and a touch line in the 12s elite schools final on the Wednesday. 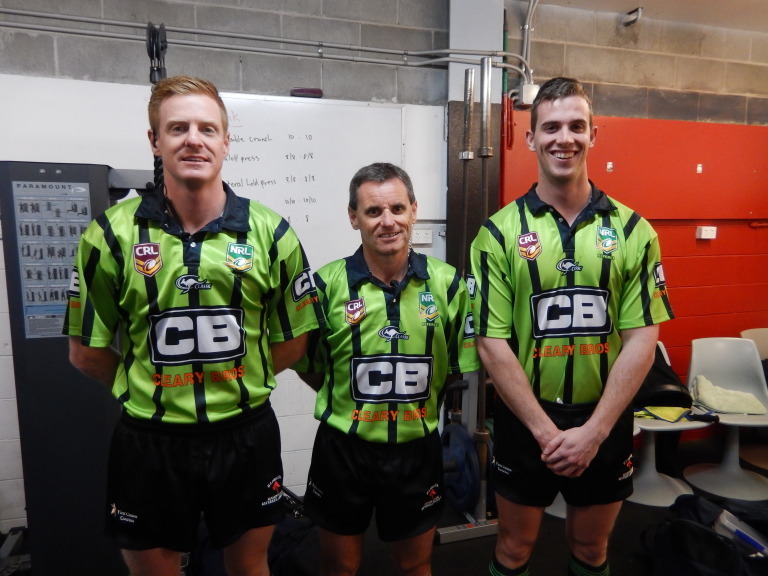 Last Sunday was a first for Group 21 referees when the youngest group of match officials controlled the first grade match between Singleton and Scone, Matt Edwards was the referee while Michael Hedges and Liam Parker were the touch judges. 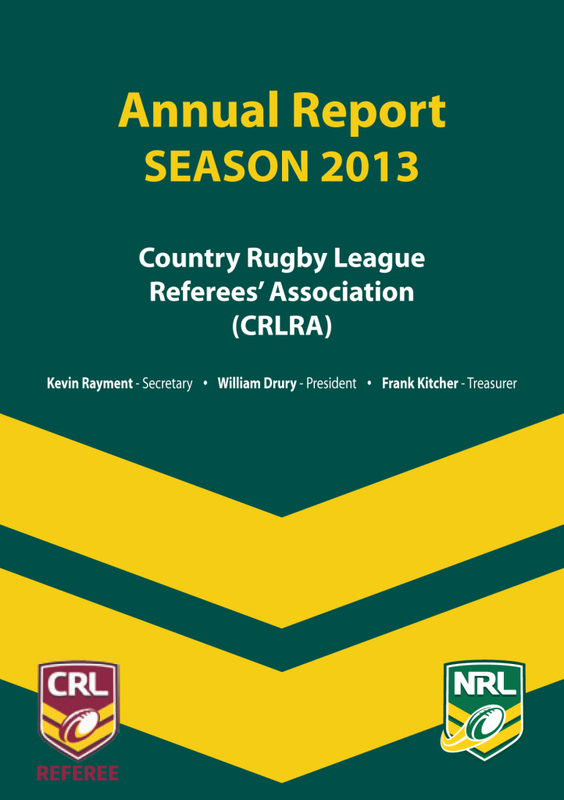 The CRLRA has Referee Performance Report Books available at $16 each including postage. These have proved extremely popular. Orders may be placed to William Drury, PO BOX 301, MILTON NSW 2538 via fax on (02) 4455 2255 or by email at print@ulladullaprinting.com.au Cheques should be made payable to CRLRA. 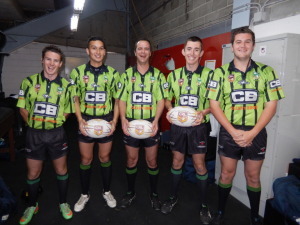 The Easter school holidays provided the perfect opportunity for 6 development squad referees and 6 development officers from the CRLRA to attend the NRL referees weekly activities. 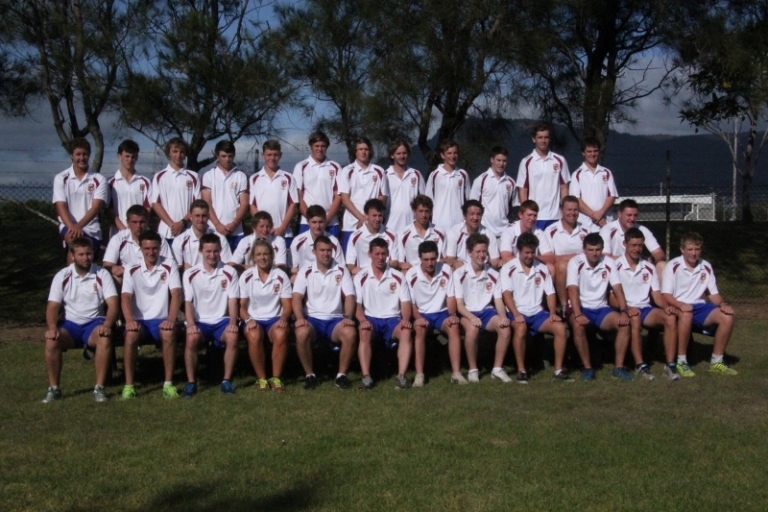 The 6 referees were selected from the Development squads; they were Corbin Kelly, Jake Whitehouse, Casey Law, Lachlan Wild, Jake White and Zac Wilson. The 6 Development Officers were Tony Hardy, Pat Walsh, Steve Toms, Wayne Wilson, Neville Norris and Kevin Petty. The week started by attending a game at the original home of Rugby League, SCG. We watched the game between the Dragons and Bulldogs. On Monday morning we were welcomed by the head coach of the NRL referees Bill Harrigan and from that point on were made part of the team. 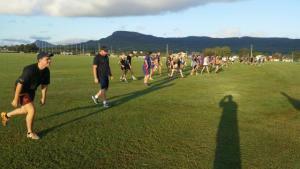 All the boys trained, watched videos, went into debriefs, all activates that the NRL referees did our boys did as well. The Development Officers participated in all activities with the coaches and assessors. At training sessions the boys took part in all the drills and on Thursday morning after the NRL referees had completed their training run before heading back to the office Bill stayed behind to give the young refs a few more drills to work on to help improve their game. It was a big thrill for the boys being able to have a one on one with the head coach. Russel Smith and Stuart Raper also gave the boys a lot of helpful hints throughout the week to assist the boys. On Tuesday night Matt Cecchin, Ashley Klein and Gavin Reynolds took the boys to the movies, giving them an opportunity to talk to them in a more relaxed atmosphere. Wednesday, a meeting was held between the Referees, Development Officers with the President and Secretary of the CRLRA to discuss a number of issues including the annual seminar, with all present having some very good input into how we can attract more active referees to this annual event. This was the first time that such a meeting has taken place since the development squads was introduced. A very big thank you to the CRLRA executive for committing the finances for this week, Bill Harrigan and Stuart Raper and all the NRL Referees and staff for opening their doors and allowing the young referees to get an insight in what is required to becoming one of the top referees in this country and the Development Officers for giving up their time to bring these young referees in and for their input into the week and finally to the development squad members for their outstanding effort and participating in all activities. Seeing the enjoyment and hearing the positive feedback from them made organising this week all worthwhile. One hopes that such an event can continue in some form in the coming years and in Bill’s word “hope to see some of these fine young gentlemen that attended sitting in the seats of the NRL referees in years to come”. Stitching devices may be shown and not required to be blacked out. This policy has been distributed to all respective Leagues and Clubs. The CRLRA Executive reinforces that this Policy applies to all Leagues playing under the banner of the CRL. This includes Newcastle, Central Coast and Illawarra. This Policy should be followed this coming weekend, 2nd and 3rd April. 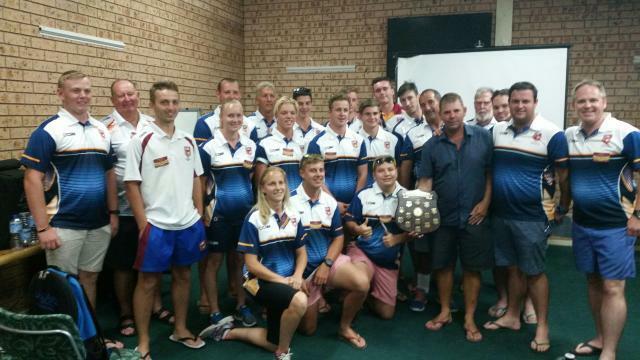 The members of Group 2 RA are the 2011 winners of the inaugural "Tony Young Shield" awarded to the Association with the best results in the Laws Exam conducted at the Annual CRLRA Workshop. The Group 2 team of five referees under the astute leadership of Ken Smith were judged the best Laws association based on the results of the exam. Group 3 RA came in a close second. Former NRL official and current Group 6 RA Executive member, Alan Foster, achieved a perfect score and will henceforth be known as "Nadia" (after the famous Romanian gymnast who was the first to score a perfect 10 in Olympics competition). Congratulations to Ken and his team but rest assured that after seeing the impressive shield that has been donated by Tony Young there will be a fair bit of pressure on them next year to retain it. Congratulations also to Tony Young for coming up with this fantastic initiative to make the Laws section of the Annual Workshop more interesting. Tony proudly displays his shield in the photo above as he hands it over to CRLRA Vice-President, Kevin Forde. 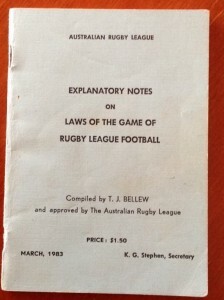 Following a submission by the National Refereeing Accreditation Scheme (NRAS) Sub-Committee to the ARLD Council at its meeting of Thursday 2 December 2010, it was resolved that I write to all State and Territory Leagues to clarify that the 40/20 Law IS to be played in all Mod League Under 12 Competitions. There had been some confusion about whether the rule applied in Junior competitions. (a) "bombs" or "high up and unders"
"'Chip' punts, grubber kicks and kicks for touch (subject to Law 14) are permissible.". The next Meeting of the Country Rugby League Referees Association will be held at the Best Western Plus - Apollo International Hotel, 290 Pacific HighwayCHARLESTOWN 2290 (Newcastle region) on Saturday 16th June 2018. Every Association is asked to have a delegate in attendance. For further information please contact the Secretary. The 2018 CRLRA AGM will be hosted by the Group 6 Referees Association in the Macarthur area. Stay tuned for details as they become available. 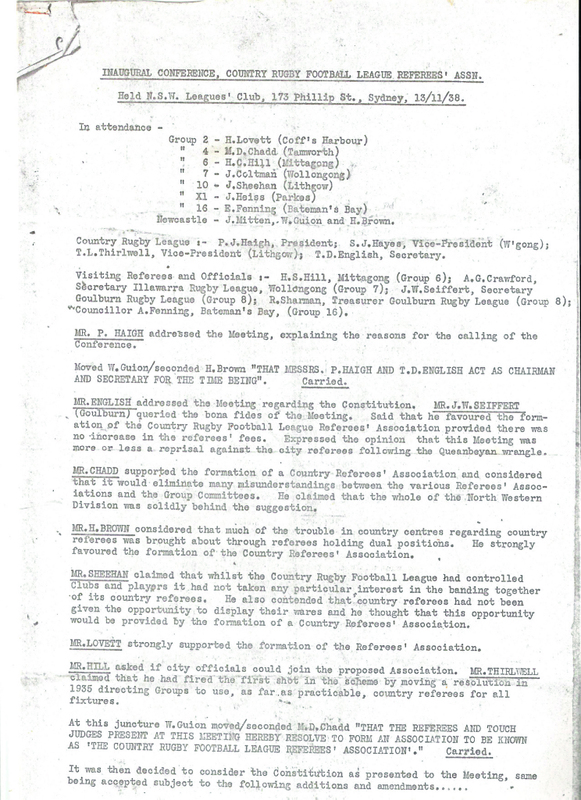 There have now been fourteen editions of the CRLRA newsletter "Country Refs Roundup". 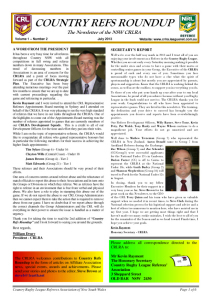 Ask your Association Secretary for a copy or go to our Documents section and download a copy.